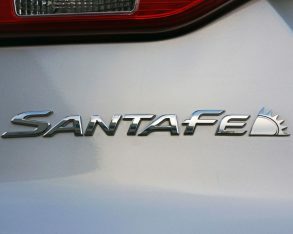 the same time in 2000, the Santa Fe as a new breed of crossover SUV and me as a new media breed of auto journalist. 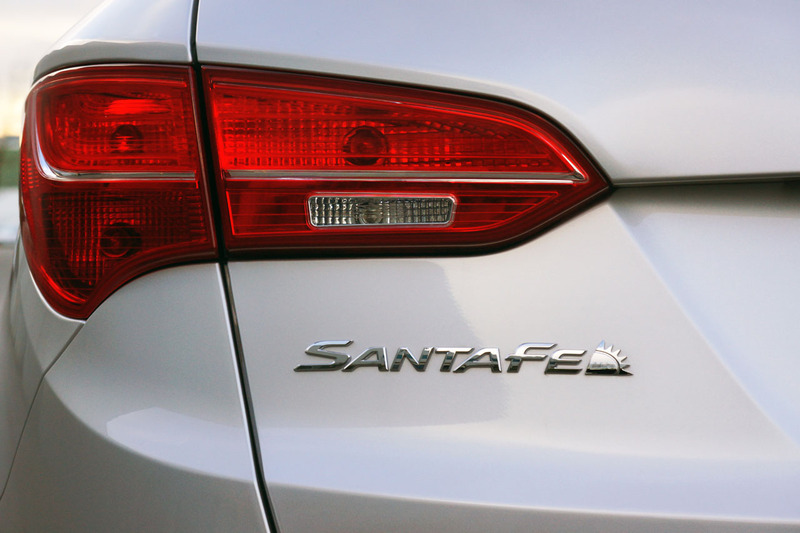 It has since grown in size and sophistication and I’ve since found my work printed in newspapers and magazines as often as online, but one thing about the two of us is very different, the Santa Fe has been a great deal more successful than I.
It’s also aged much more gracefully, the current 2014 Santa Fe much more attractive than the first-gen iteration I tested on its national launch program so long ago. 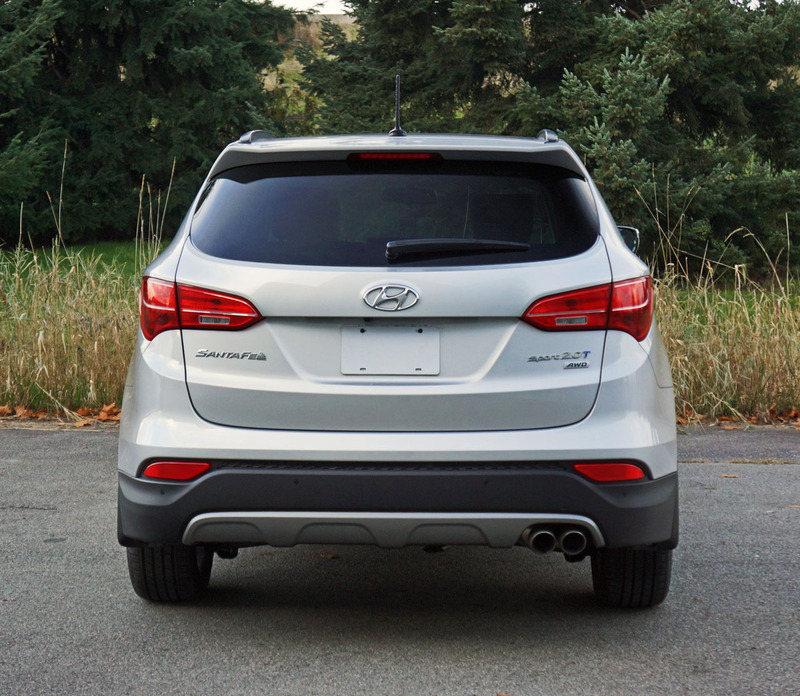 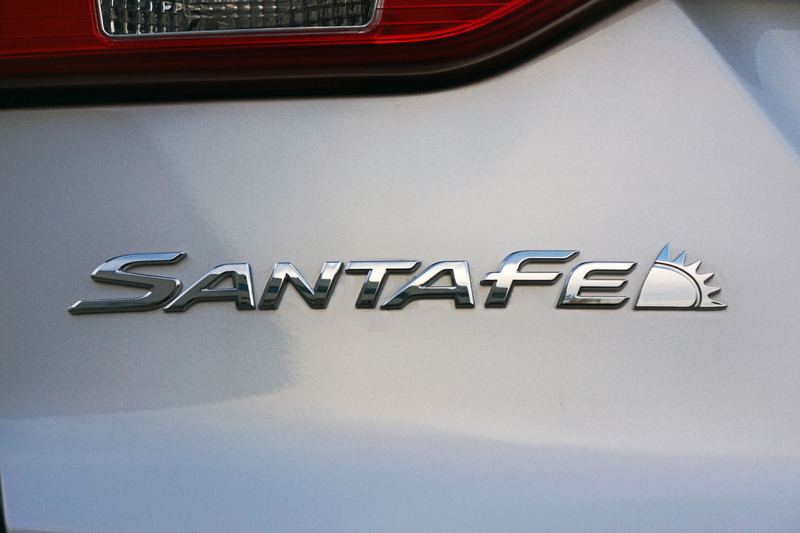 Like me it’s a little thicker around the middle, although the Santa Fe wears its weight gain much better as it’s proportionally applied across its entire body. 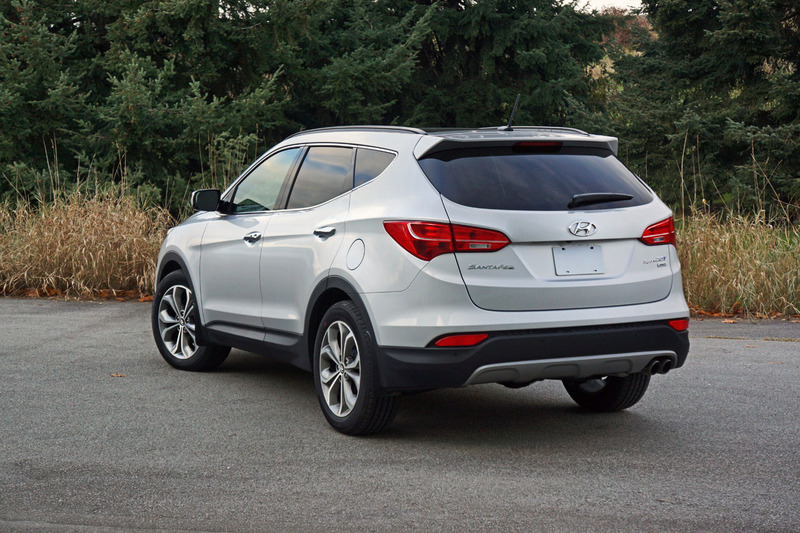 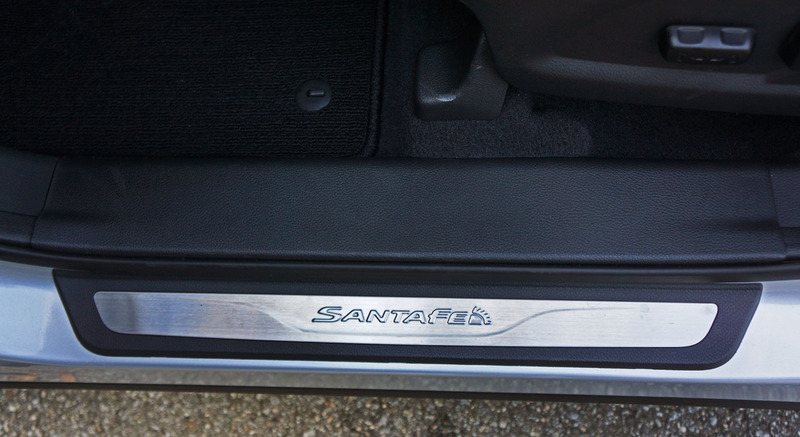 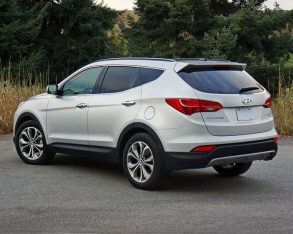 Actually, the Santa Fe, especially in its shorter five-seat Sport model looks downright athletic, one of the best designs in the midsize crossover SUV segment. 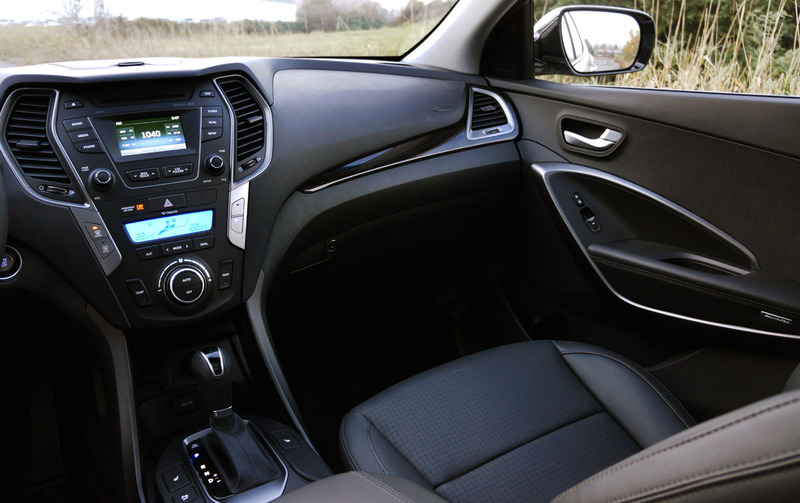 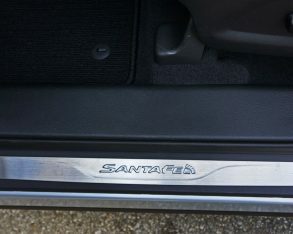 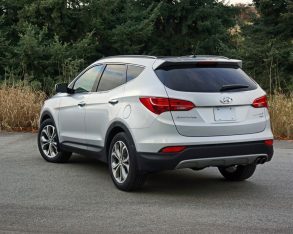 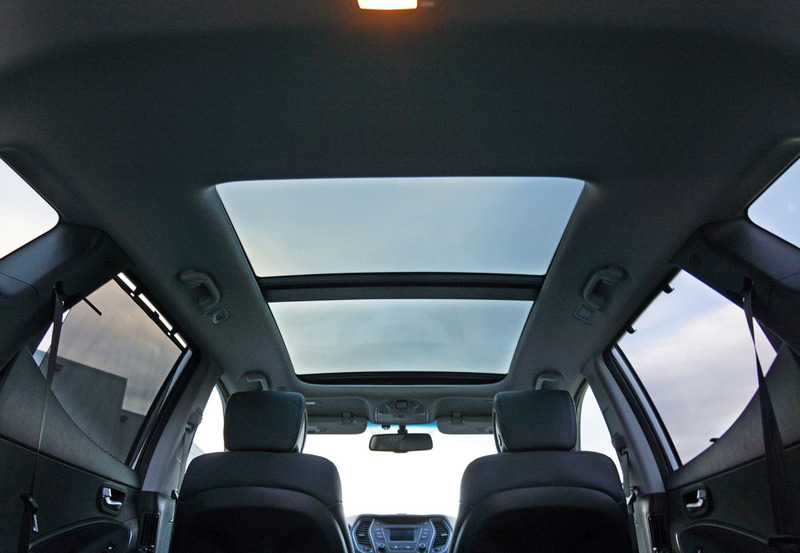 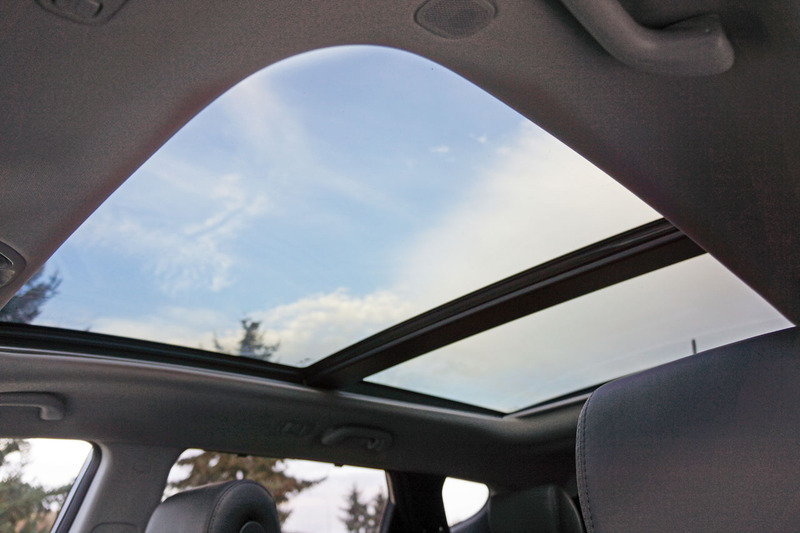 case you weren’t aware, there are now two different Santa Fe models, the five-seat Santa Fe Sport and the longer seven-passenger Santa Fe XL, both differing significantly from their midsections rearward. 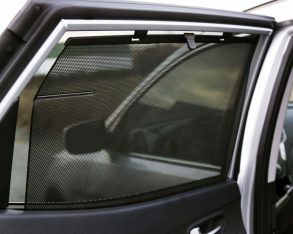 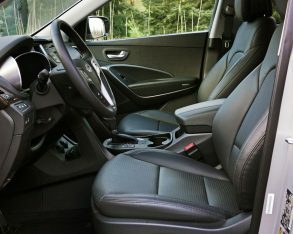 I tested each recently, and being that they’re both very unique in style and execution I’ll leave the larger XL to a future review and deal specifically with the short-wheelbase Sport here. 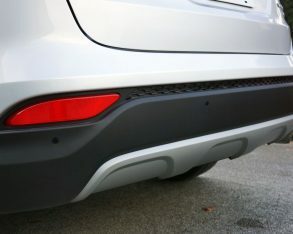 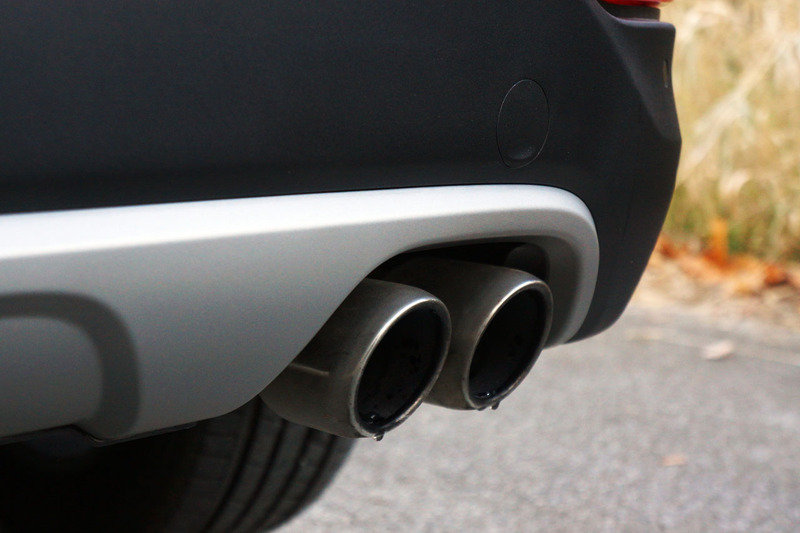 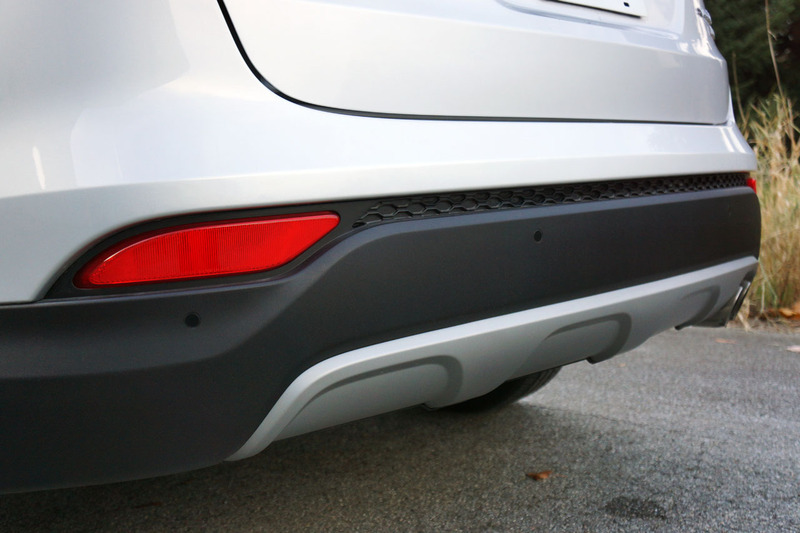 appears like a diffuser. 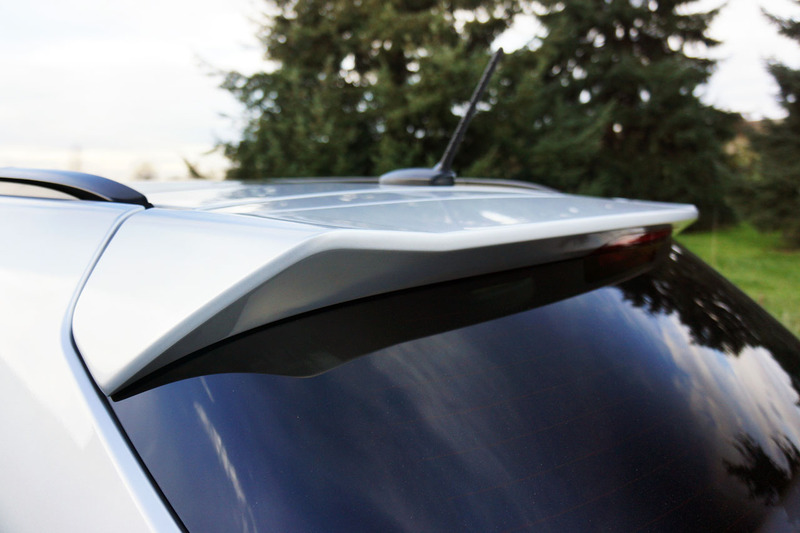 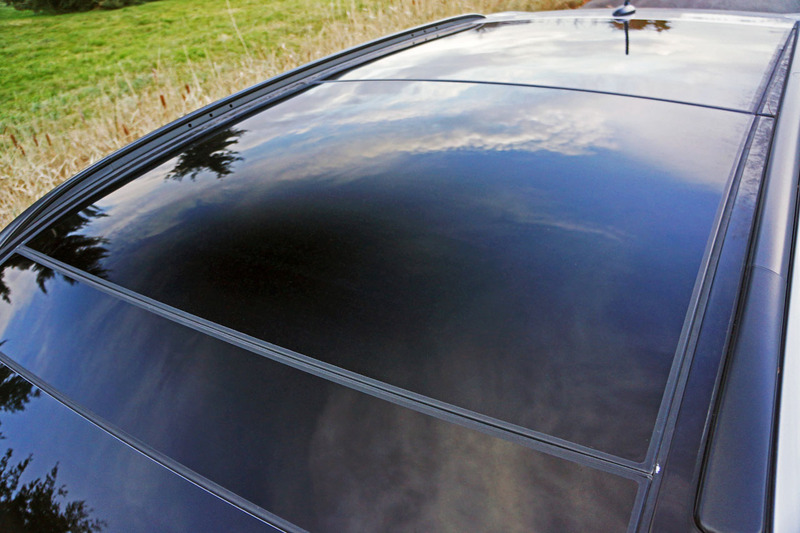 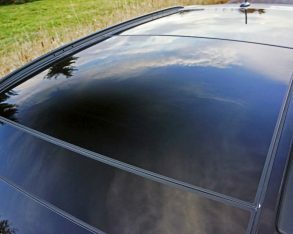 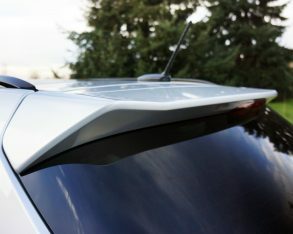 I also like the way the lower portion of the greenhouse climbs upward as it flows rearward, visually meeting up with the rear spoiler, and the way the rear beltline melds into the more sharply angled and (to my eyes at least) much better looking taillight clusters (truly, they wouldn’t look out of place on the back of a BMW X5). 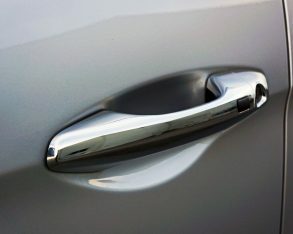 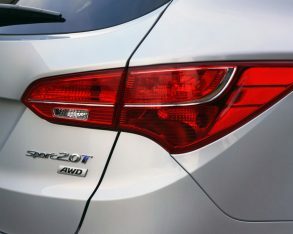 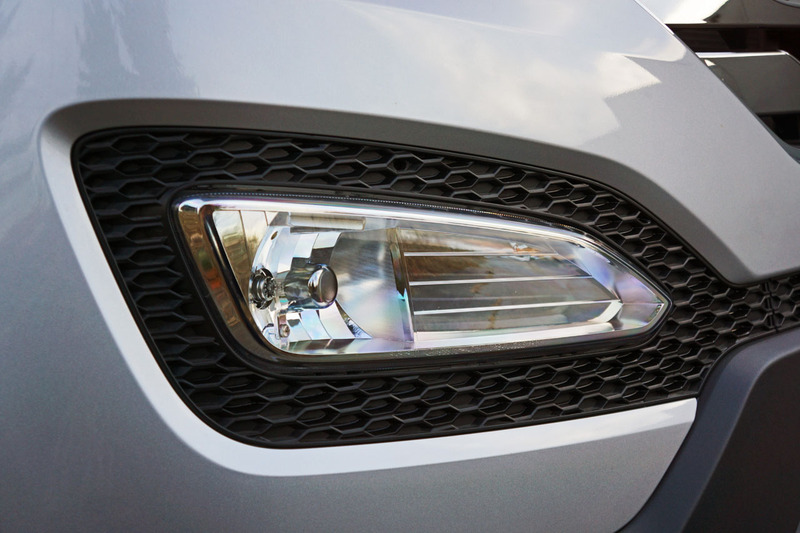 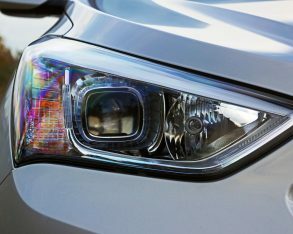 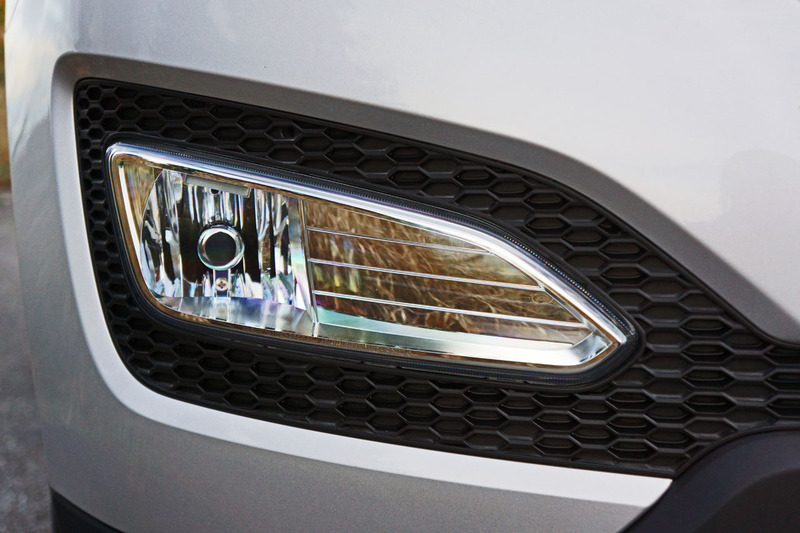 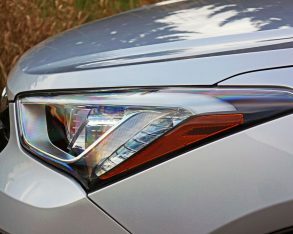 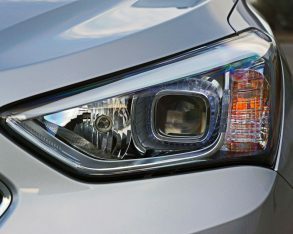 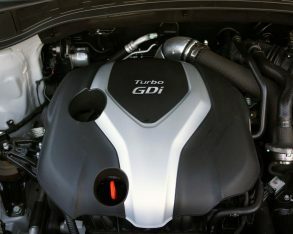 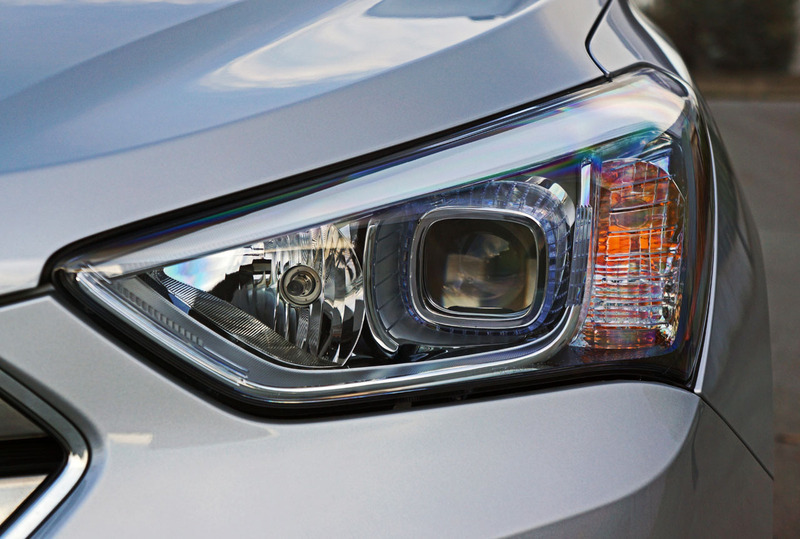 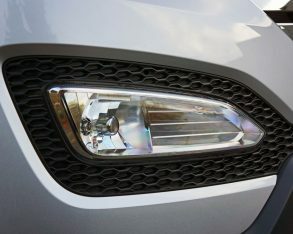 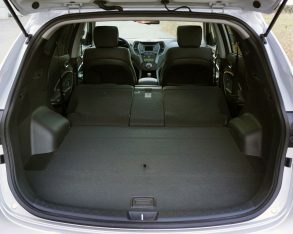 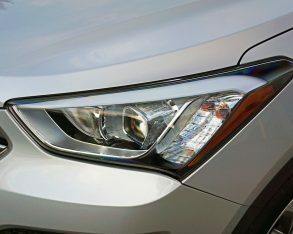 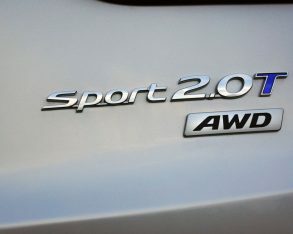 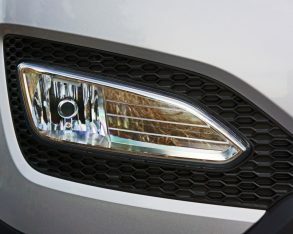 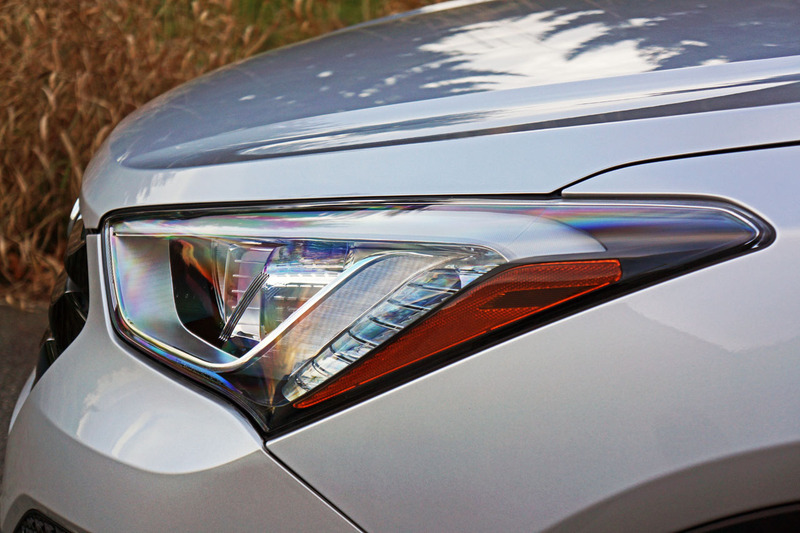 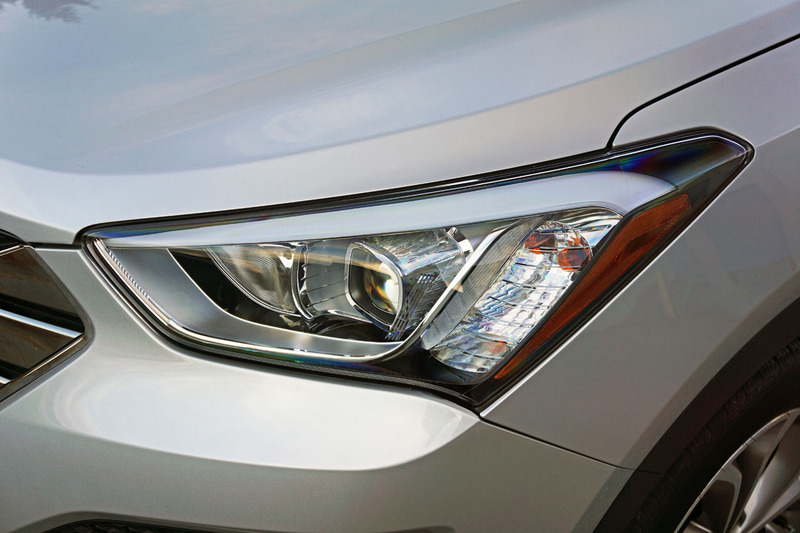 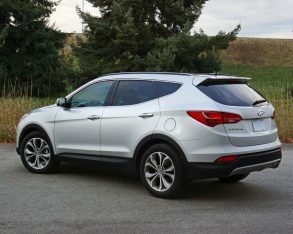 All-round, the Sport lives up to its name, delivering a more performance oriented CUV, both visually and experientially. 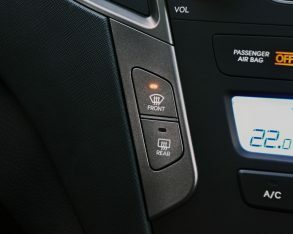 between 1,750 and 3,000 rpm where most of us need it more often. 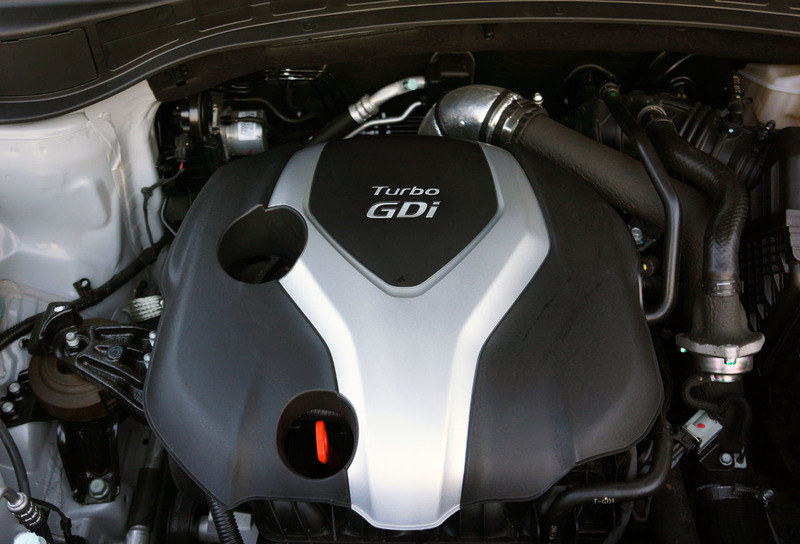 This is a wonderfully tractable engine that delivers gobs of usable power no matter the speed you’re going, ideal for quick takeoffs from standstill as well as highway passing maneuvers. 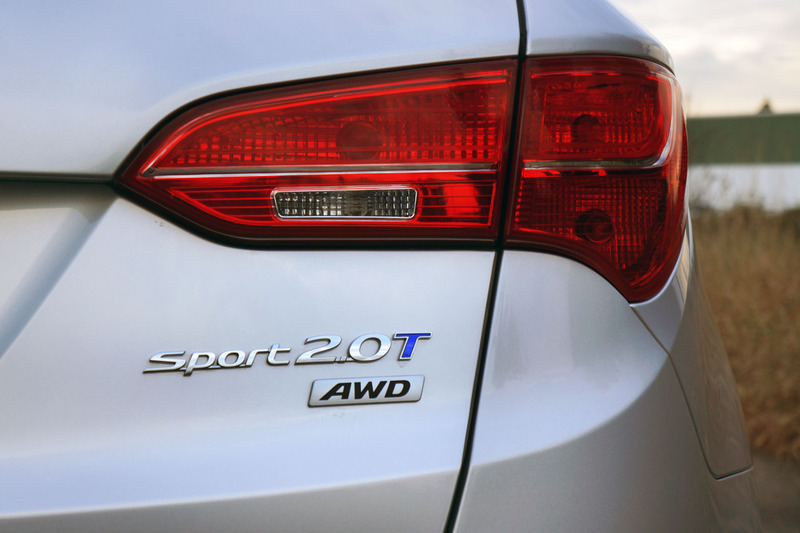 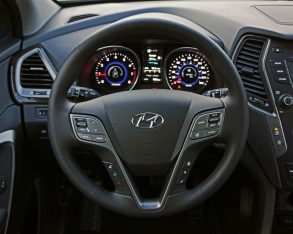 All-wheel drive comes standard with the 2.0T engine, as does a smooth and efficient six-speed automatic with manual mode. 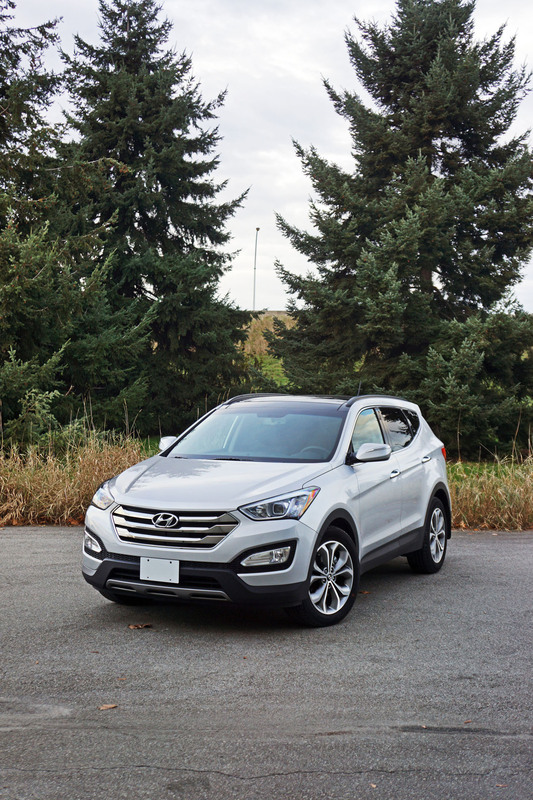 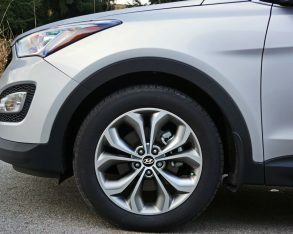 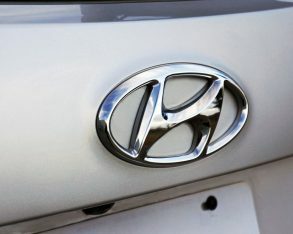 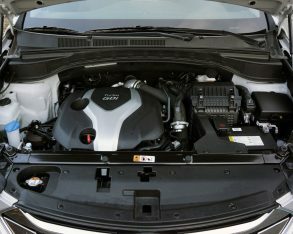 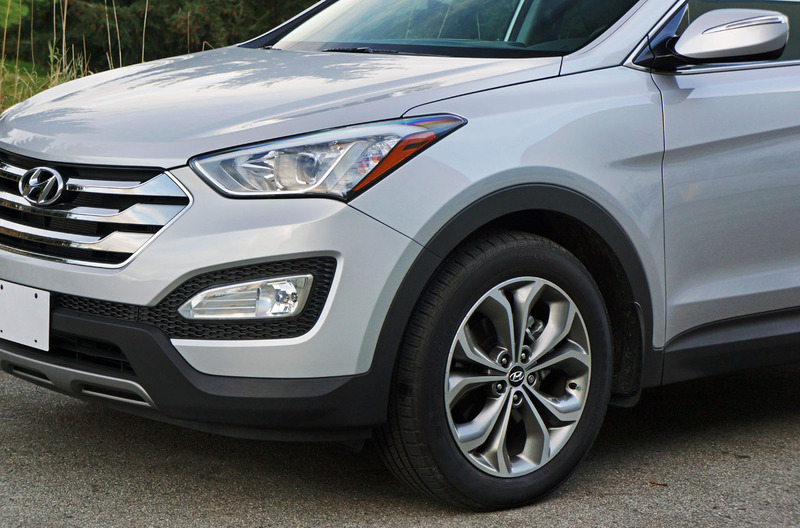 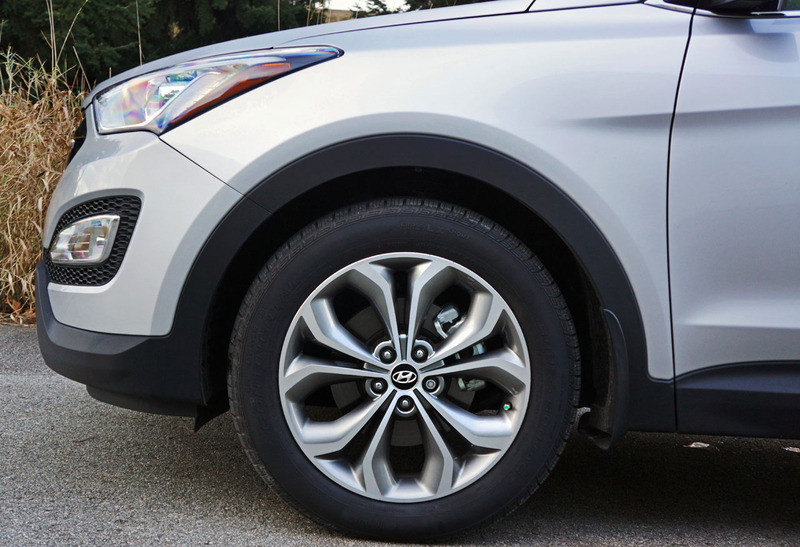 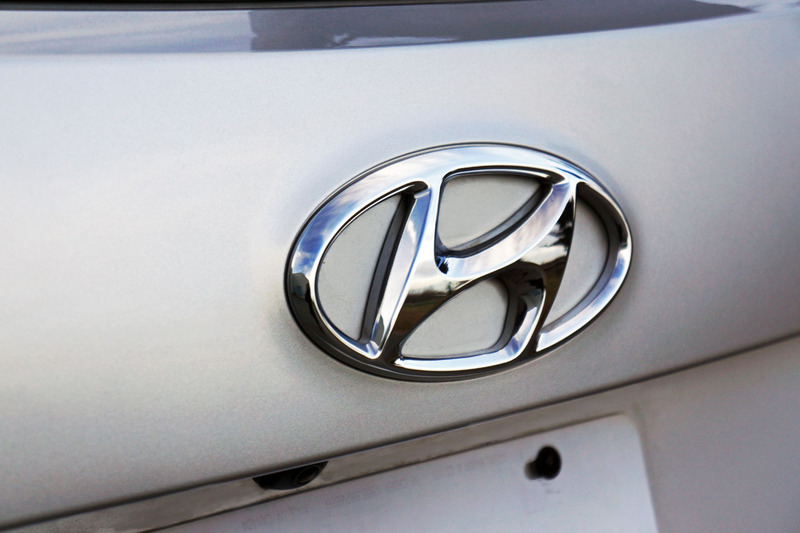 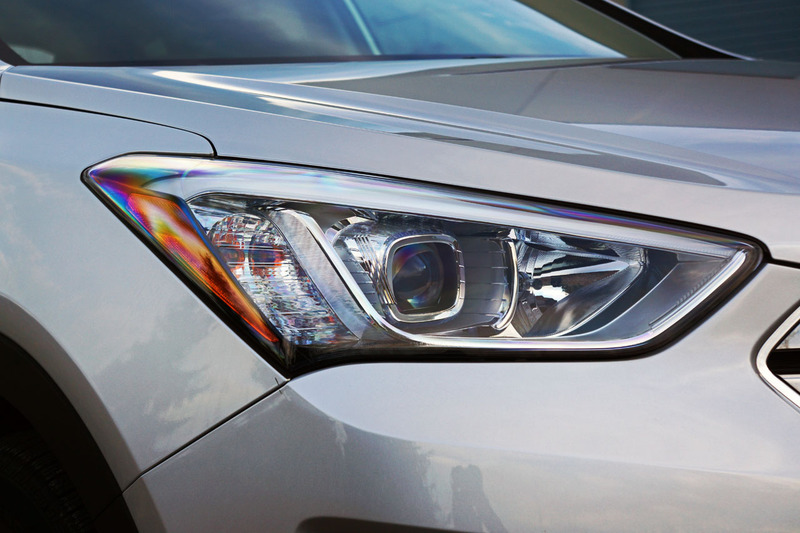 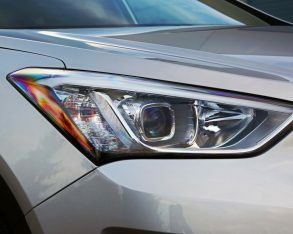 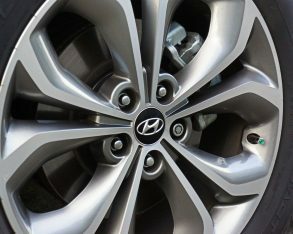 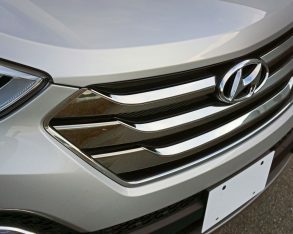 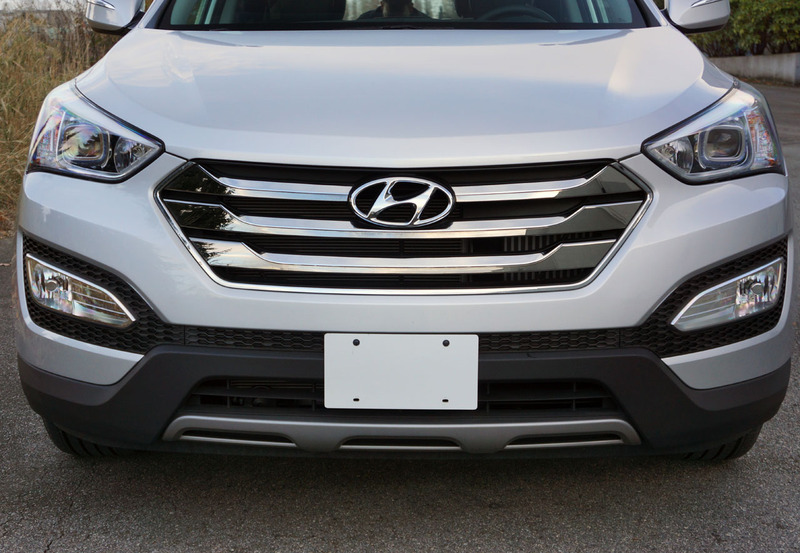 All round I can pretty much guarantee that you’ll be pleased with Hyundai’s choice of drivetrains, although if your heart is set on a V6 you can move up to the Santa Fe XL. 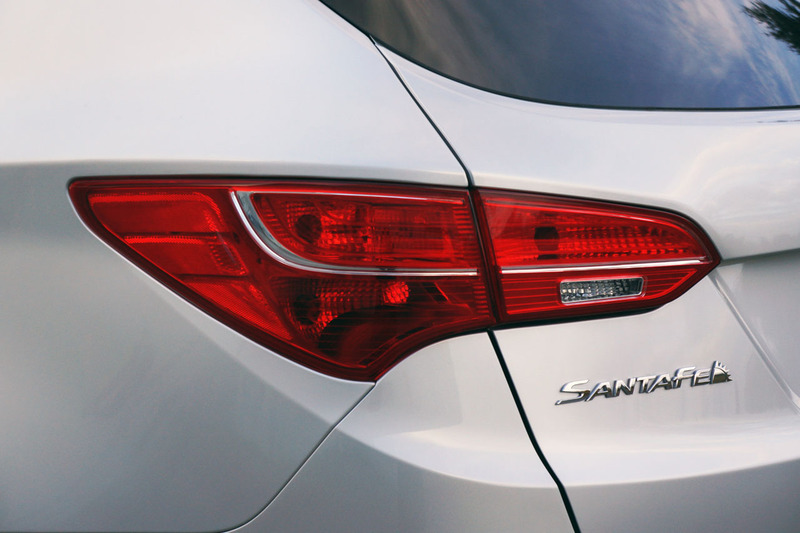 competitors. 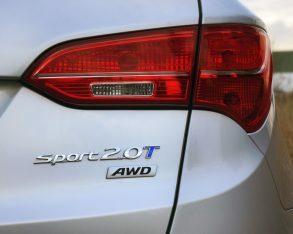 Transport Canada rates the 2014 2.0T AWD model at 11.4 L/100km in the city, 8.2 on the highway and 10.0 combined, which is excellent for the class. 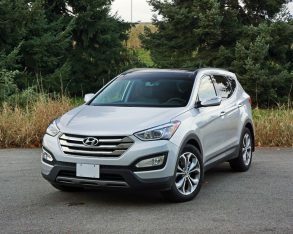 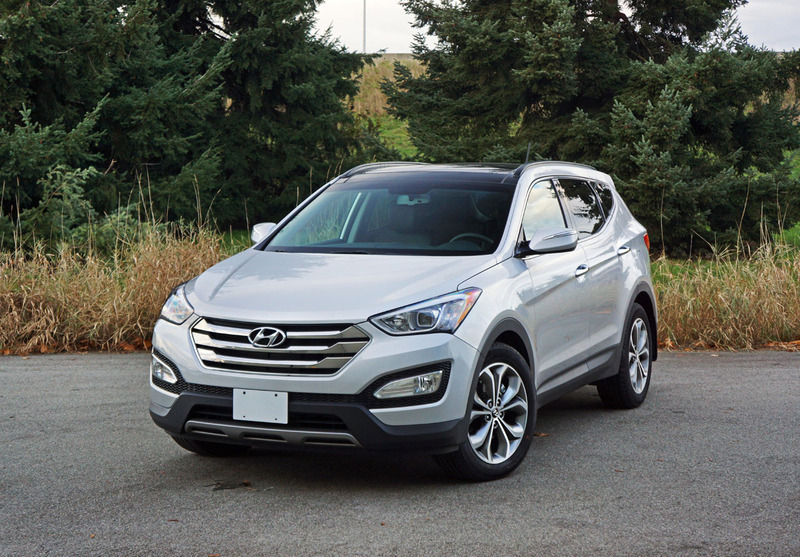 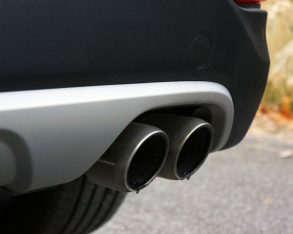 Of course these numbers change for the 2015 model year’s more realistic five-cycle testing process, so don’t go comparing this 2014 Santa Fe to anything else from 2015, including a newer Santa Fe, which incidentally doesn’t change at all yet gets a revised rating of 12.9 city, 9.8 highway and 11.5 combined. 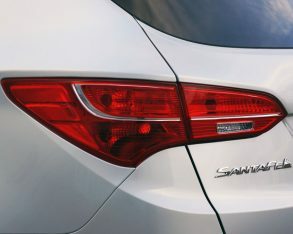 highway just happens to be the best place to enjoy a Santa Fe Sport, its compliant fully independent suspension tuned ideally to the high-speed corners and long straights today’s freeway systems offer. 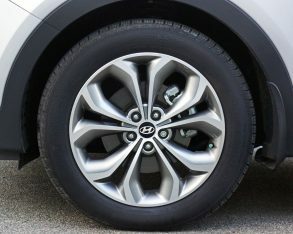 Don’t get me wrong, as it’s plenty capable through tighter curves and is a superb city dweller too, my 2.0T SE tester’s standard 235/55R19 Continental Cross Contact all-season tires enhancing cornering capability while not too harsh through what are often bumpy inner-city streets. 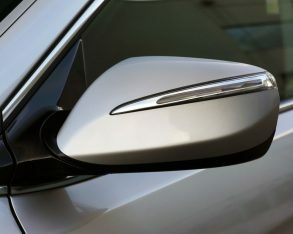 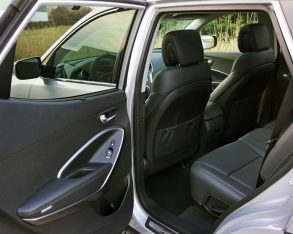 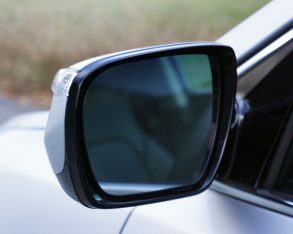 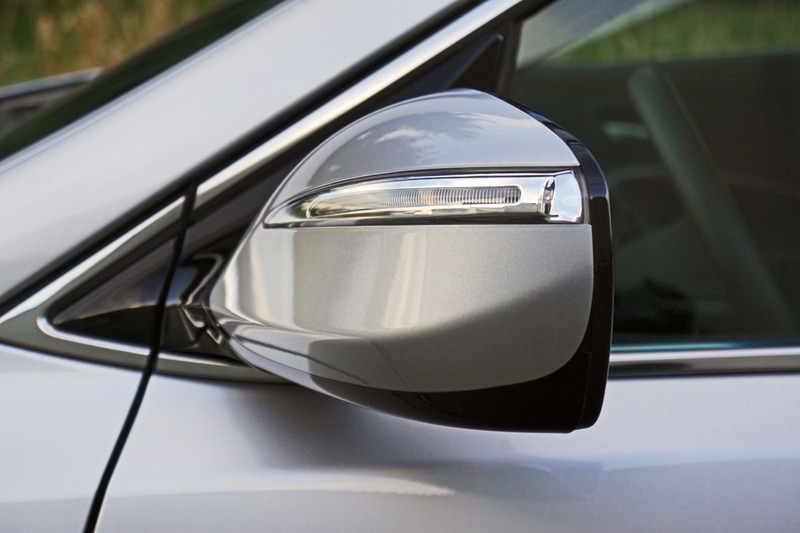 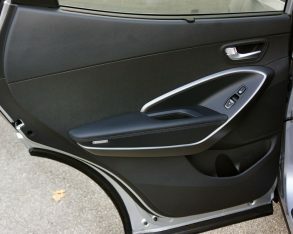 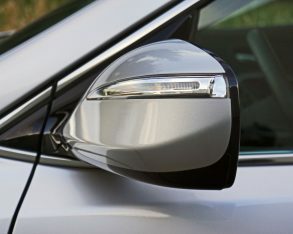 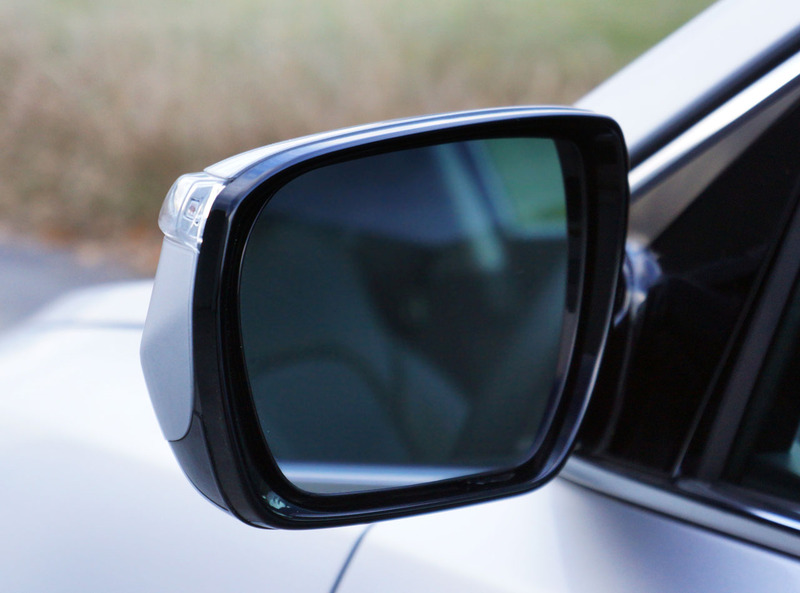 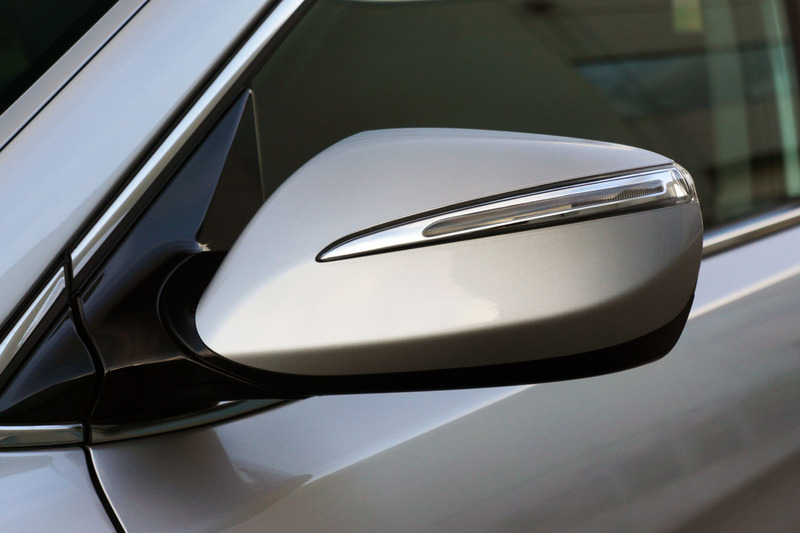 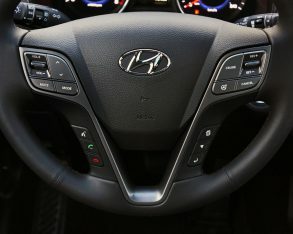 mirror housings, proximity sensing access with pushbutton start, a 12-way power adjustable driver’s seat with four-way lumbar, automatic headlamps, perforated leather upholstery, a heated leather-wrapped multi-function steering wheel, dual-zone automatic climate control, a 4.3-inch colour touchscreen audio display unit with an integrated rearview camera, an auto-dimming rearview mirror with compass, a large panoramic sunroof with a powered sunshade overhead, rear side window sunshades, and heated rear seats to go along with the base model’s heated front seats. 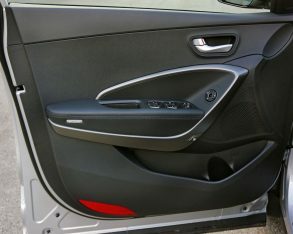 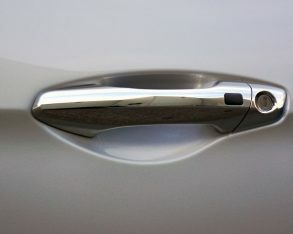 door handles, power-adjustable heated side mirrors, six-speaker AM/FM/CD/MP3 audio with satellite radio, aux and USB inputs plus iPod/iPhone integration, ultra-handy split folding 40/20/40 rear seatbacks, a full assortment of airbags including one for the driver’s knees, ABS-enhanced four-wheel disc brakes with electronic brake-force distribution and emergency brake assist, traction and stability control, and much more. 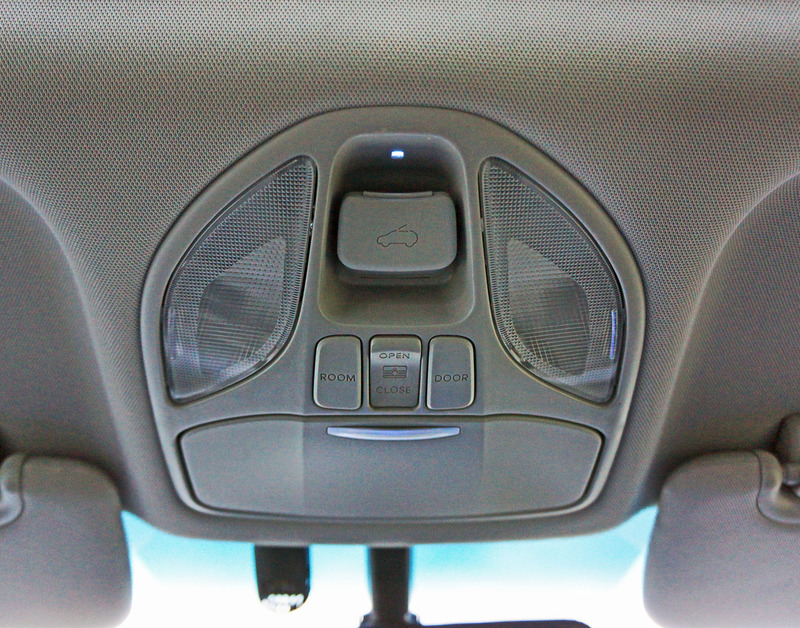 10-speaker Infinity audio with a subwoofer, ventilated front seats, driver’s seat memory, a four-way powered front passenger’s seat, and more. 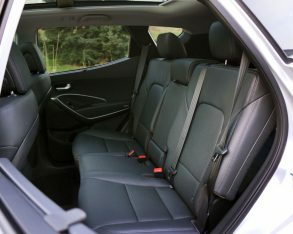 A feature that came standard with my SE and proved handy during my test were remote cargo area pulls for folding down the rear seatbacks, and their aforementioned 40/20/40 split design is really useful for optimizing passengers and cargo as you can carry four people along with loads of ski gear down the middle if needed, or split the seats 60/40 in other situations. 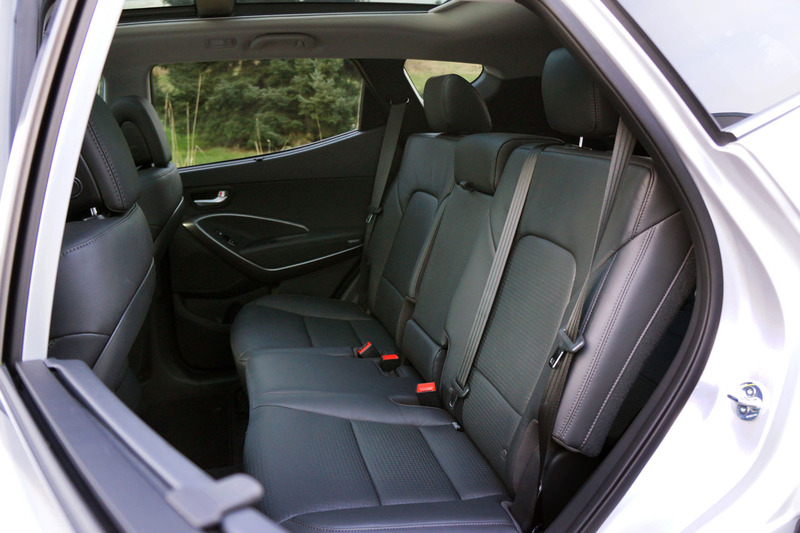 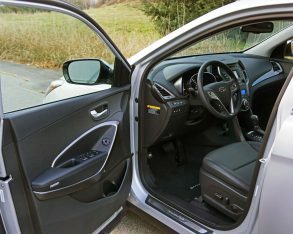 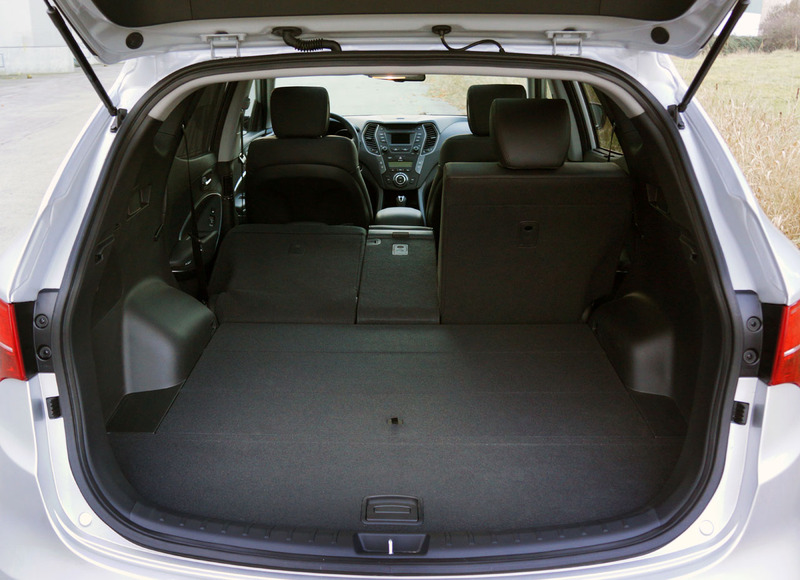 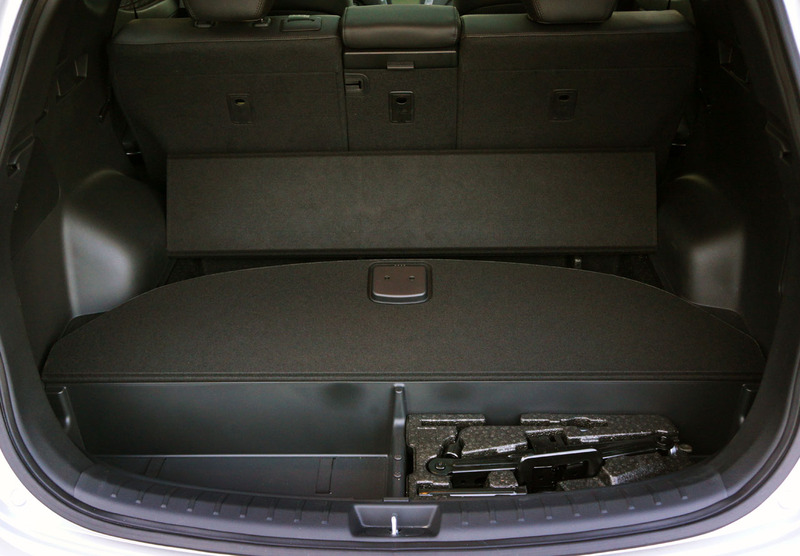 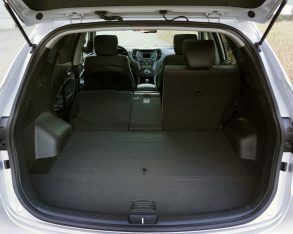 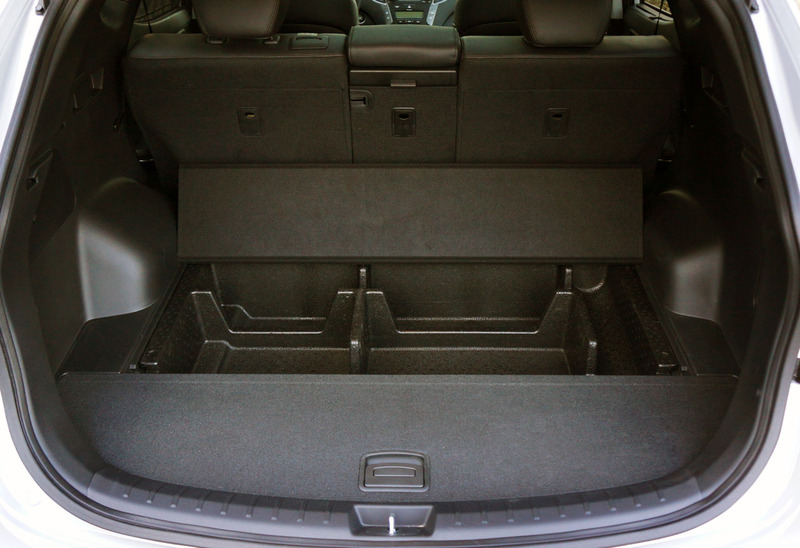 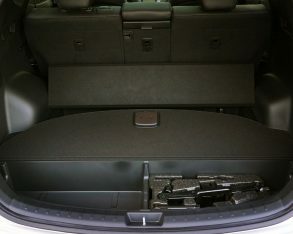 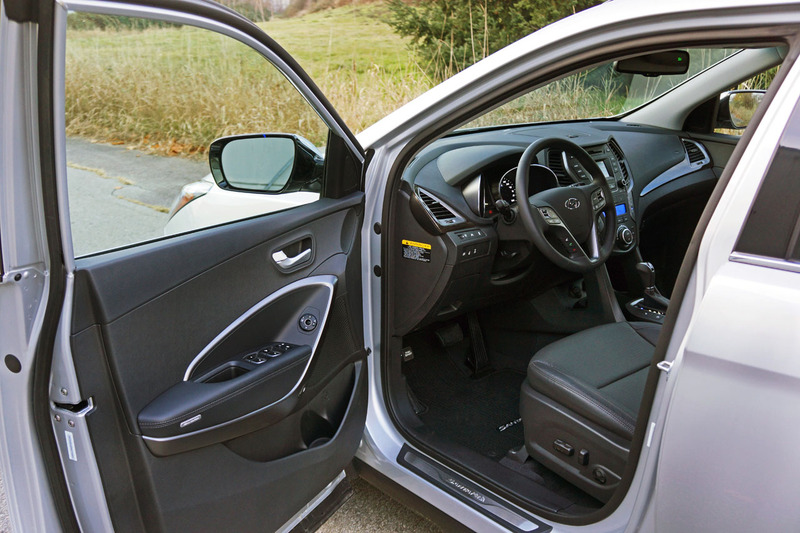 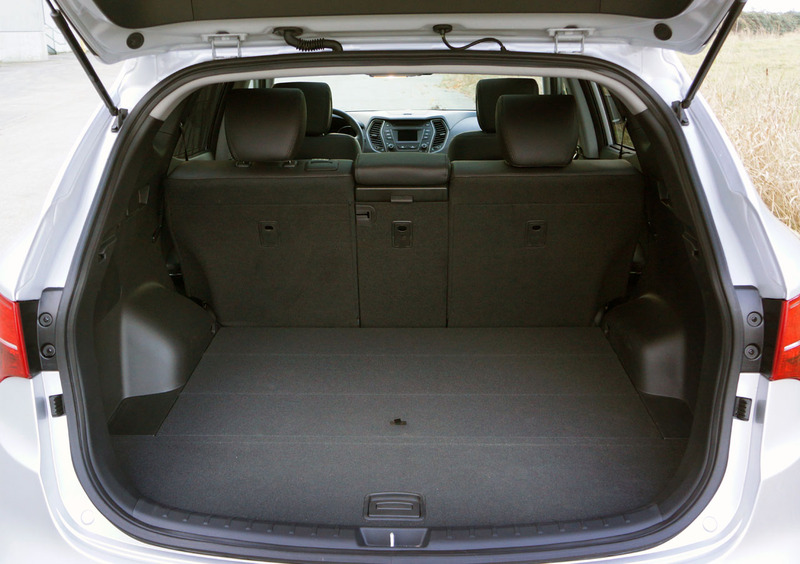 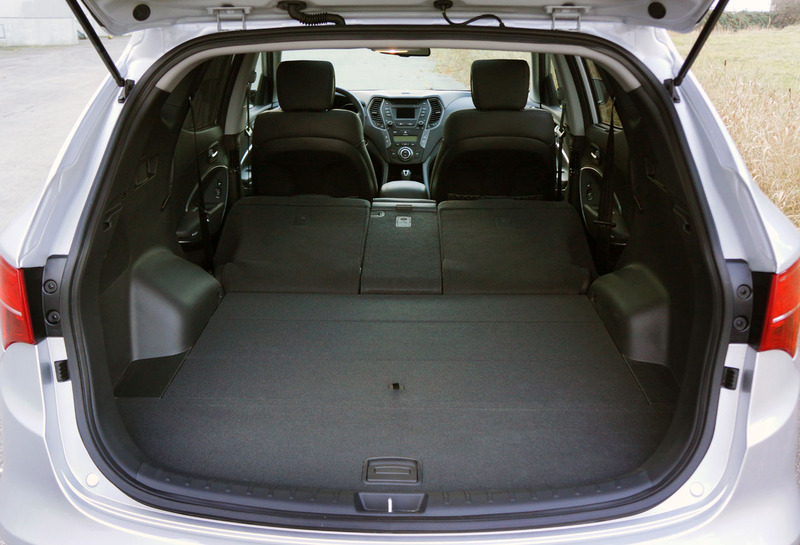 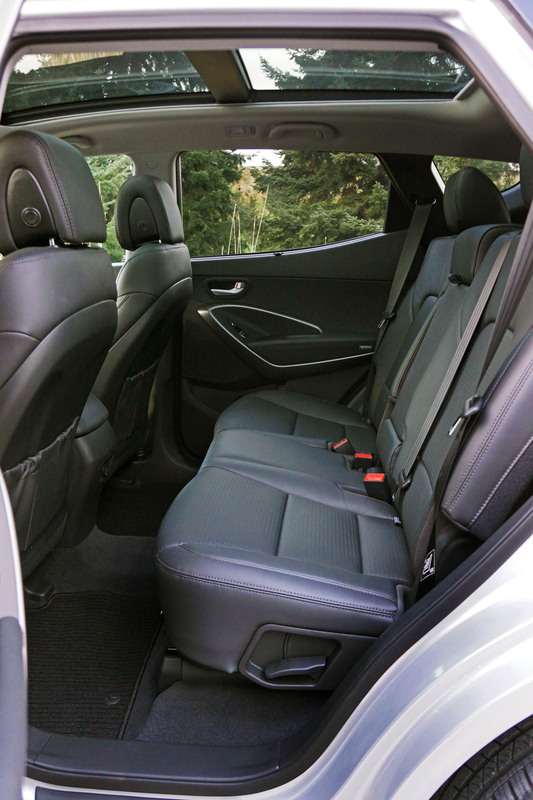 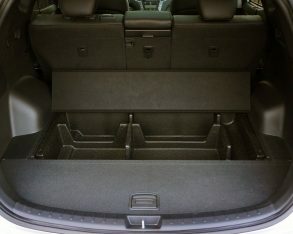 Most in this class only offer a 60/40-rear split, so kudos to Hyundai for doing this right, while load space is excellent and the cargo floor, which sits above a large covered bin, is thick and solid feeling. 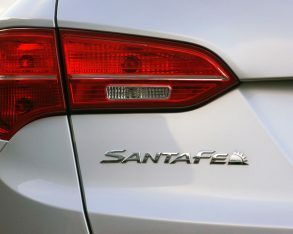 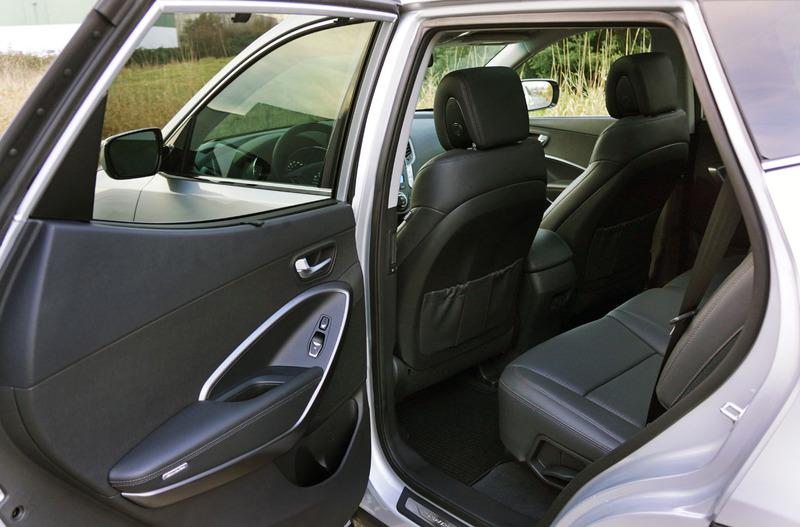 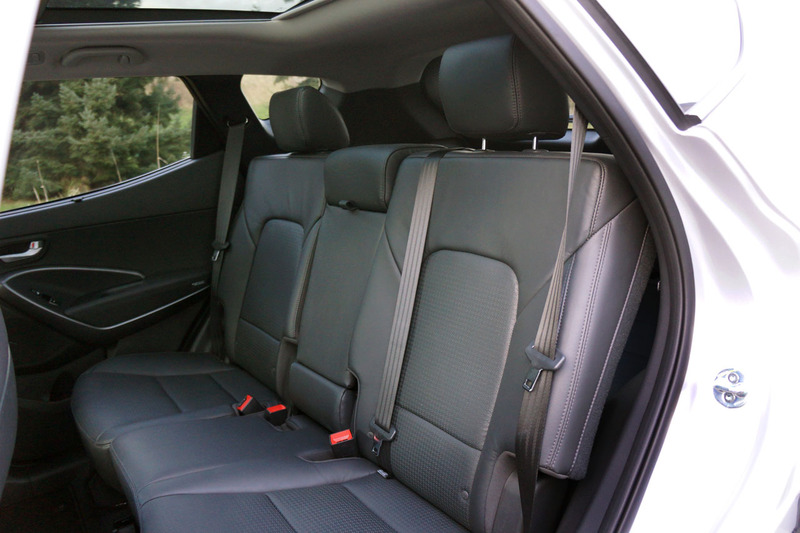 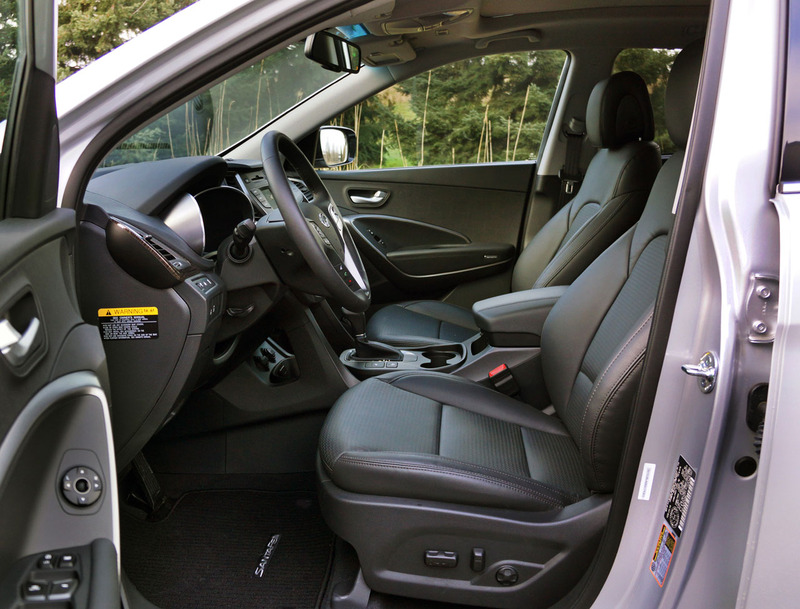 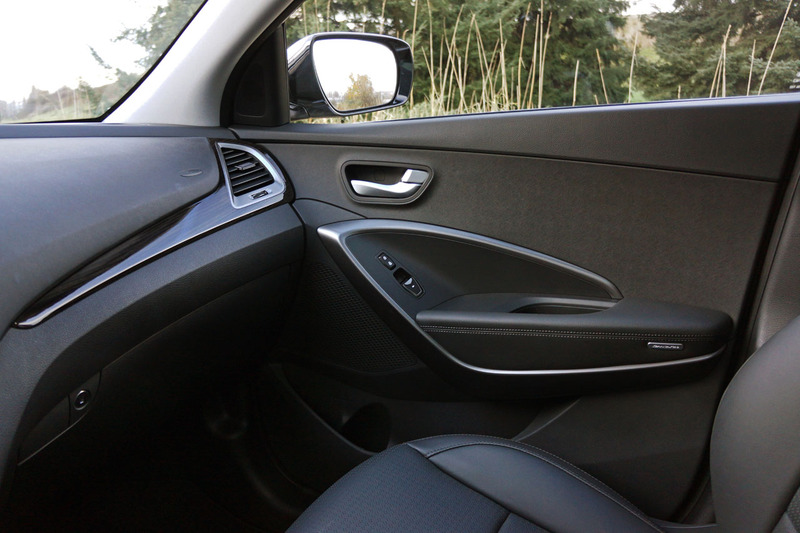 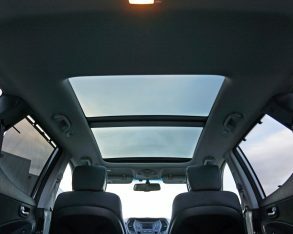 should be commended for getting the Santa Fe’s cabin right in other ways too. 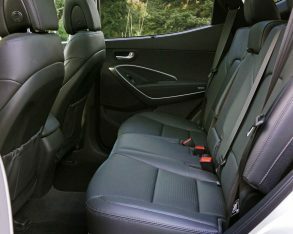 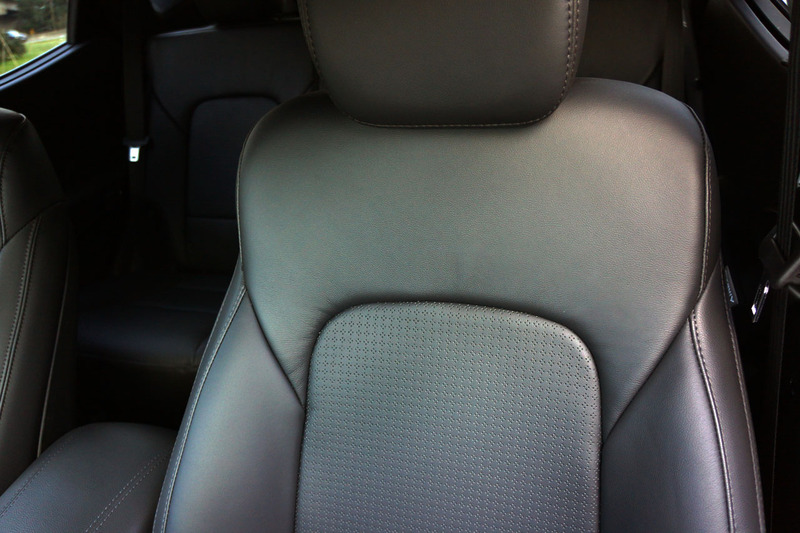 My Sport SE looked much the same inside as its larger XE brother, including really attractive solid feeling woodgrain trim that’s unusually upscale for this class. 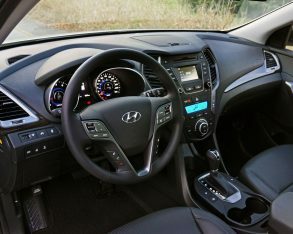 This is what immediately caught my attention, but a closer look throughout the interior revealed soft-touch surfacing to the dash-top and instrument panel facing, door uppers and armrests, front to back. 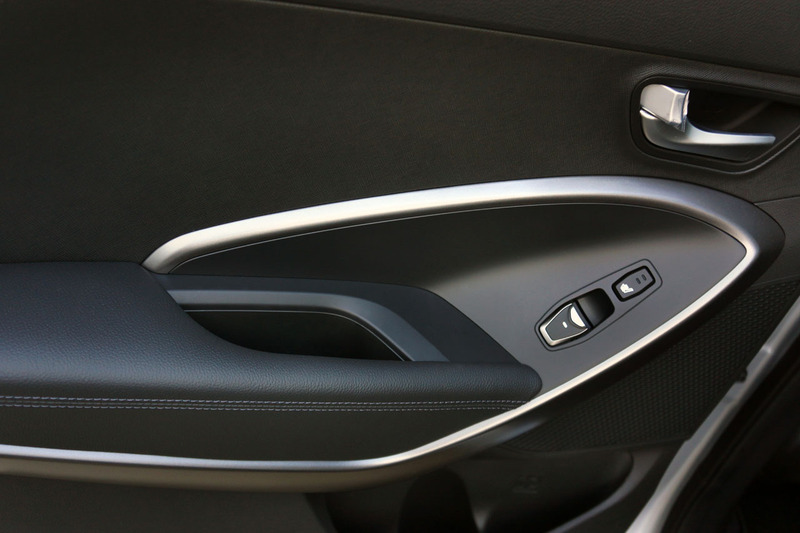 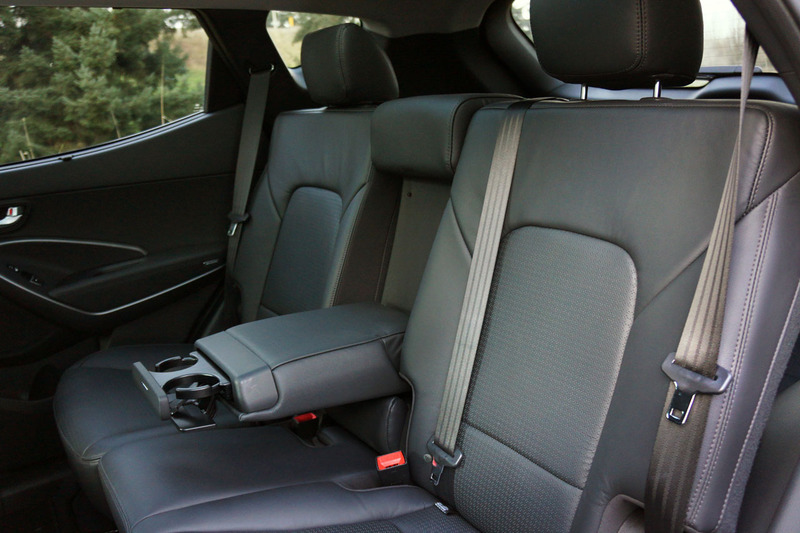 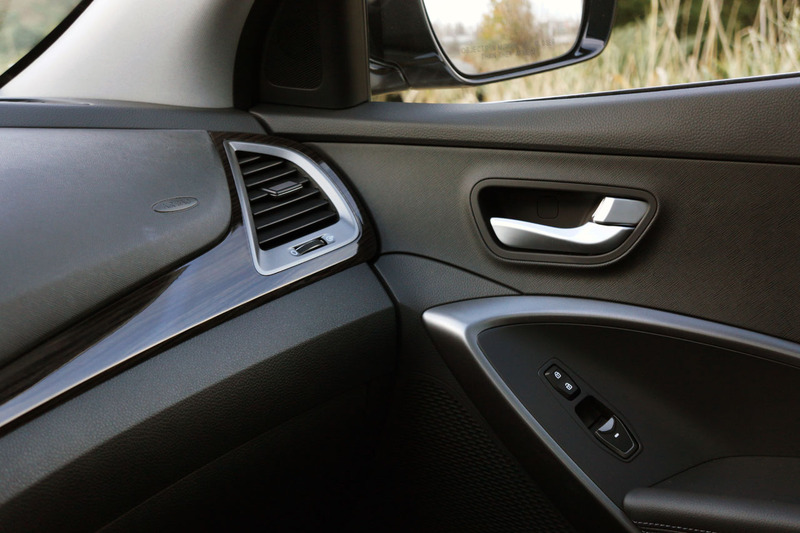 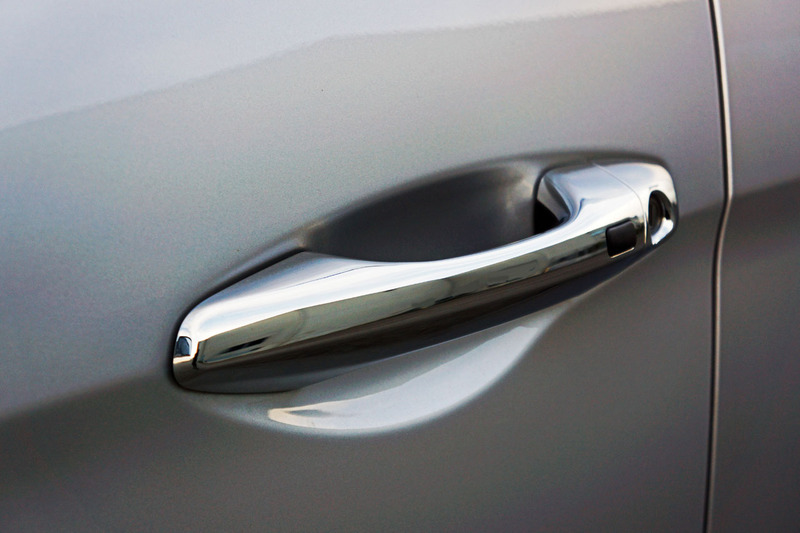 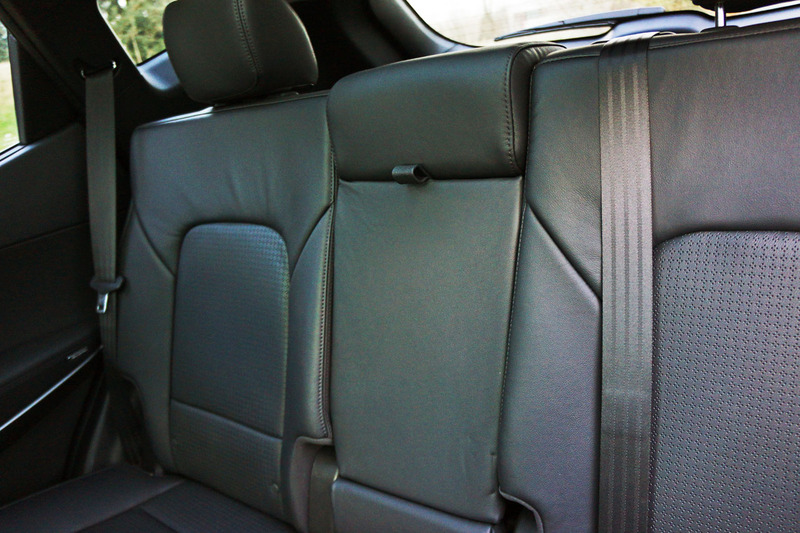 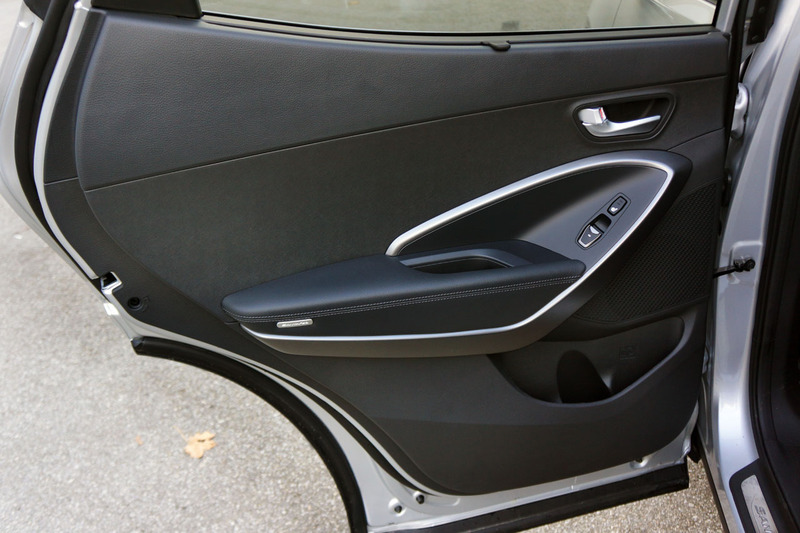 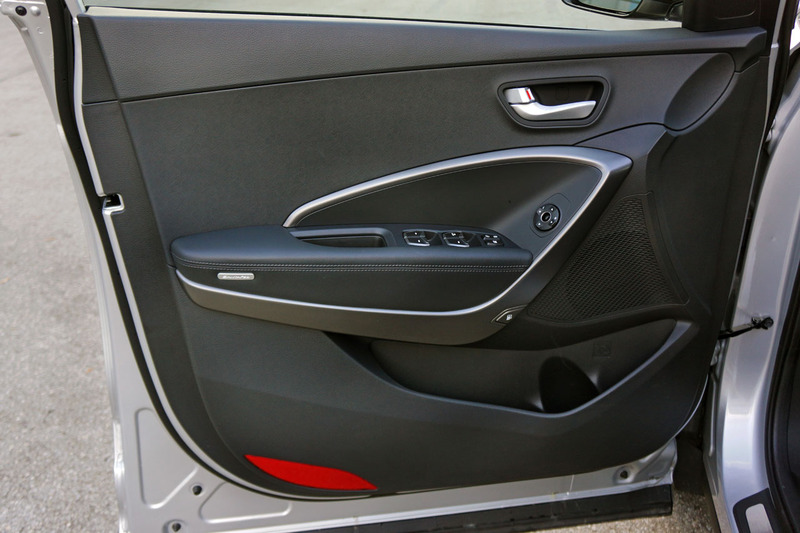 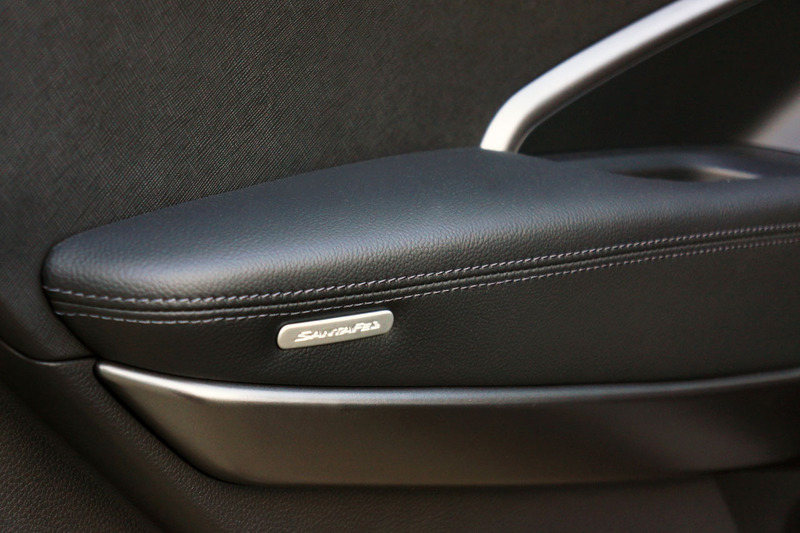 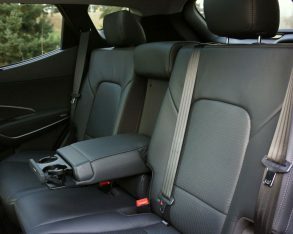 Those armrests are covered in a very upscale leather-like material with contrast stitching highlighted by attractive satin silver finished surrounding trim that also accents other parts of the door panels and dash. 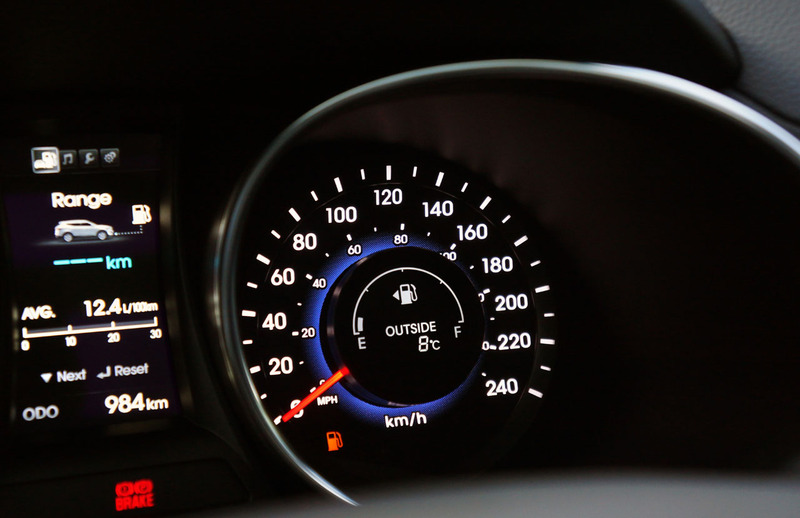 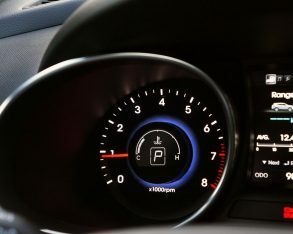 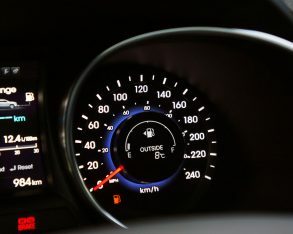 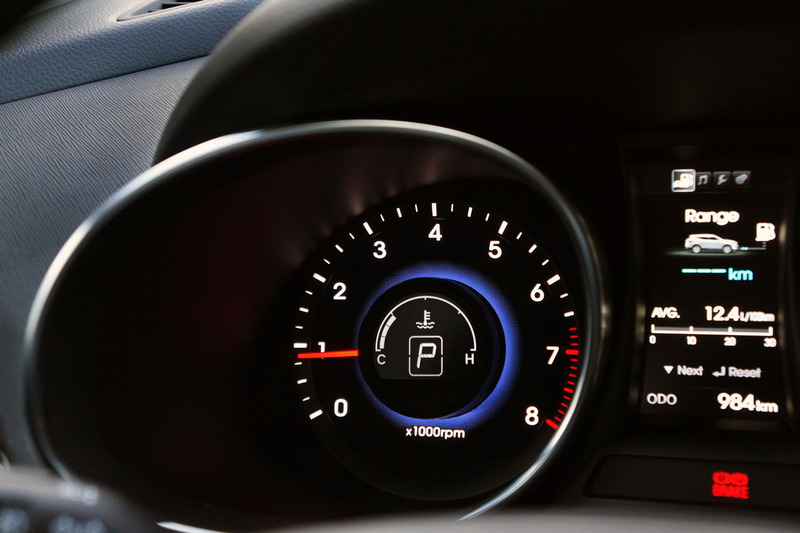 Right in front of the driver is one of the sportiest looking gauge packages in the crossover segment, with big motorcycle-style circular dials wrapped in a cool brushed aluminum-like finish, both flanking a useful full-colour TFT multi-information screen. 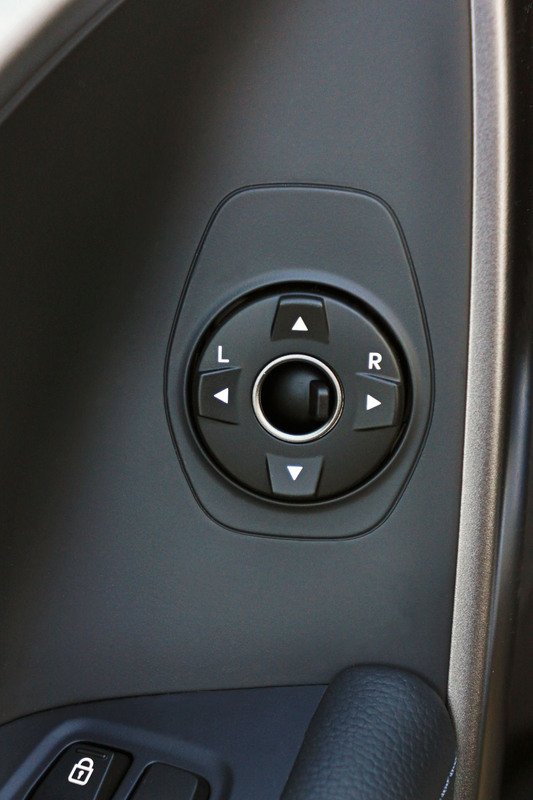 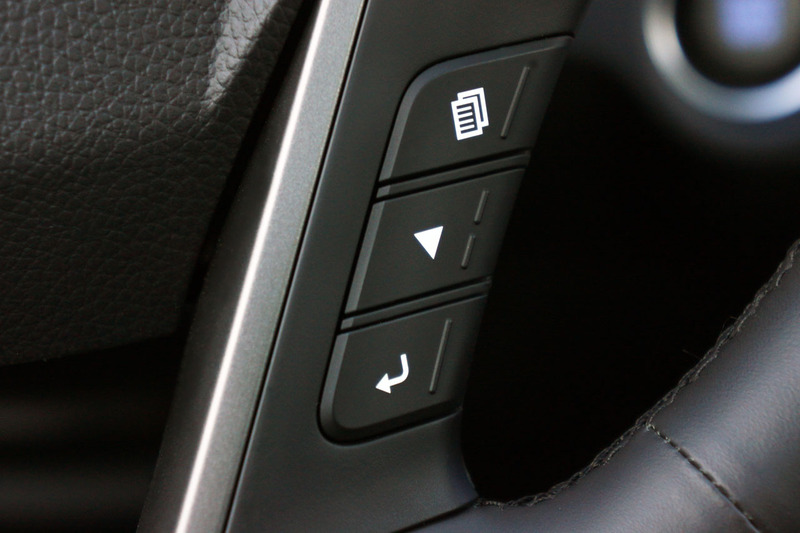 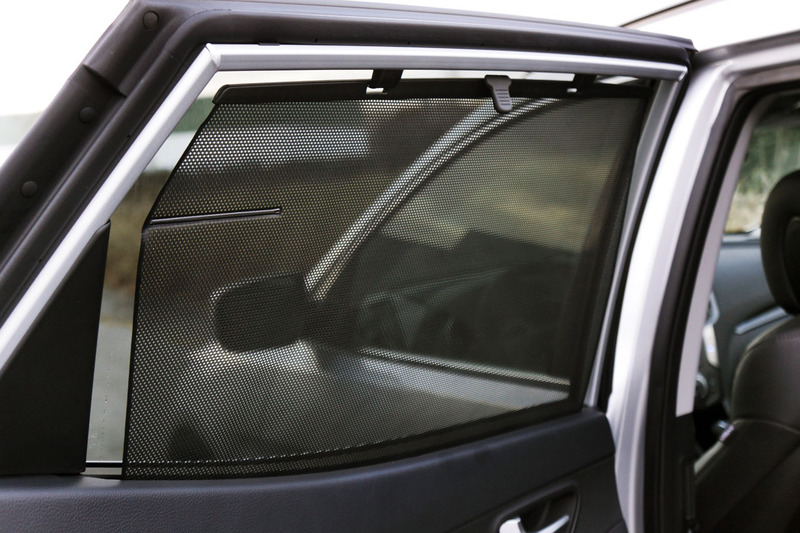 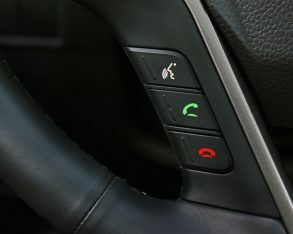 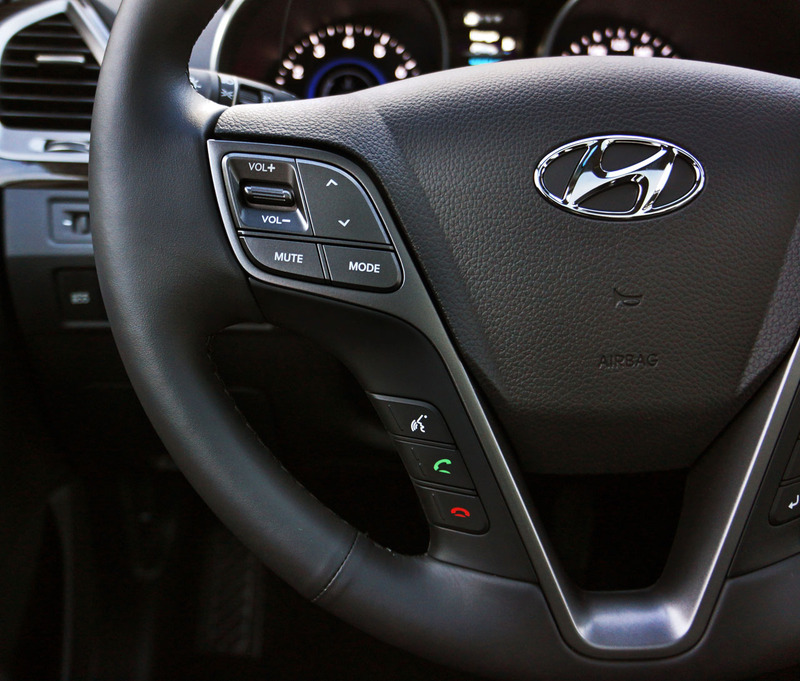 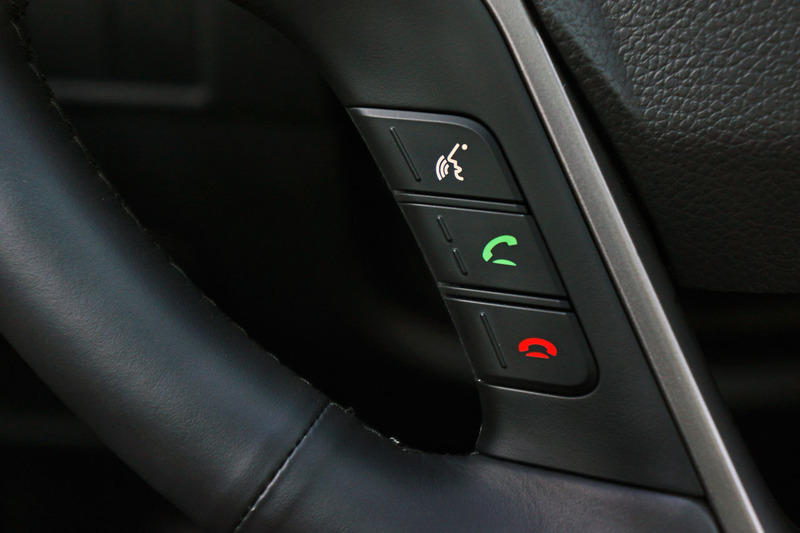 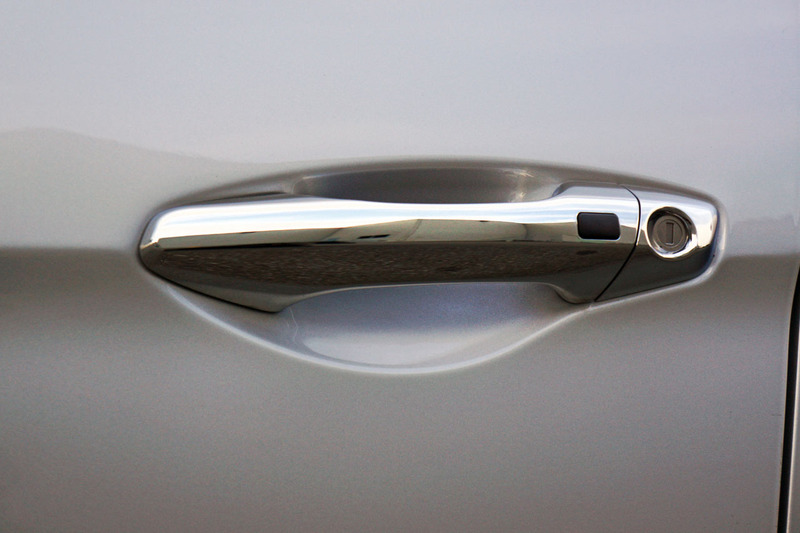 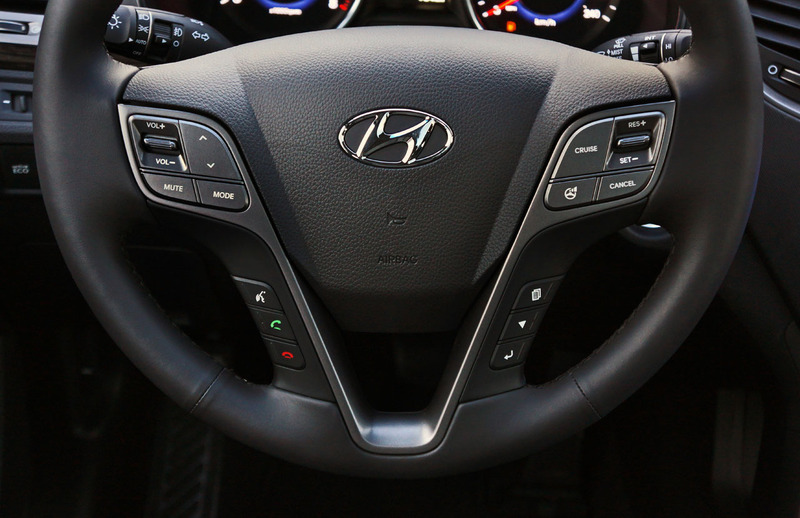 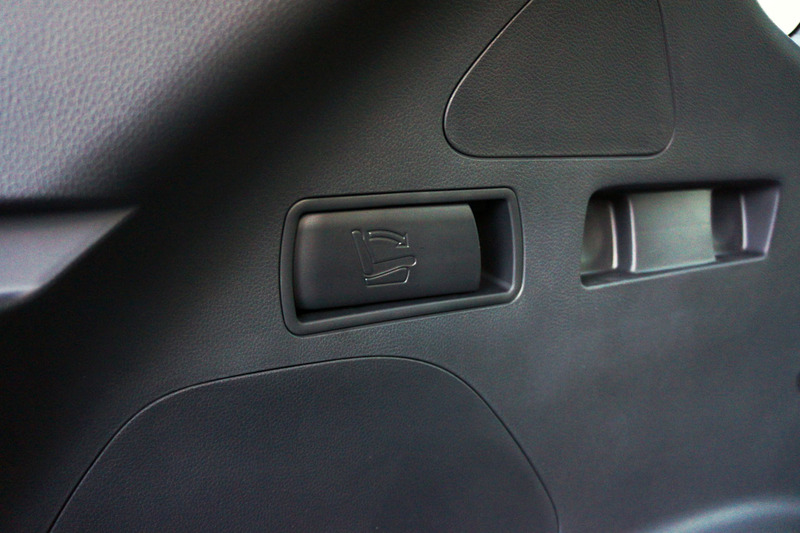 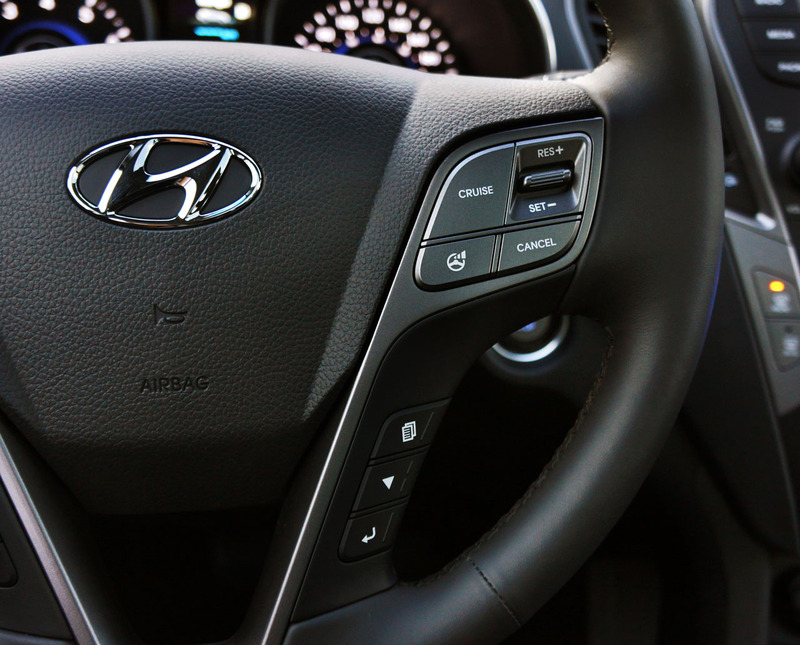 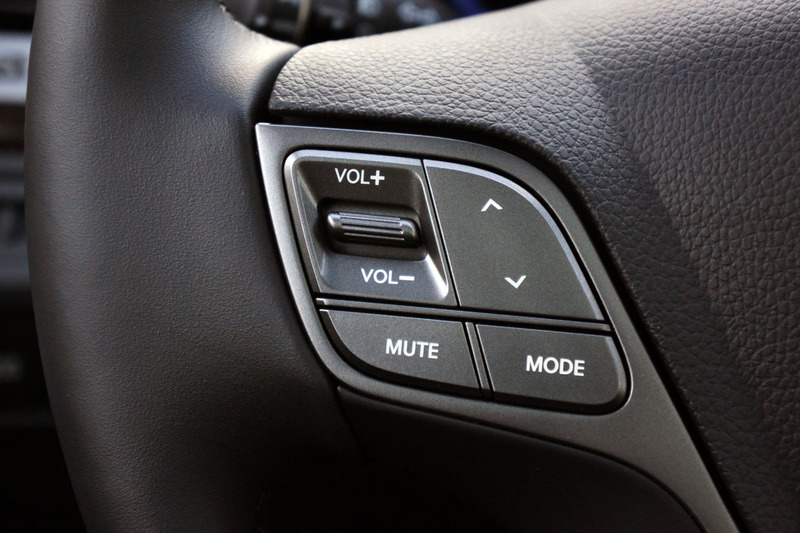 A full assortment of steering wheel buttons allows easy access to the MID’s various functions and other features. 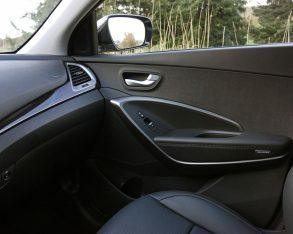 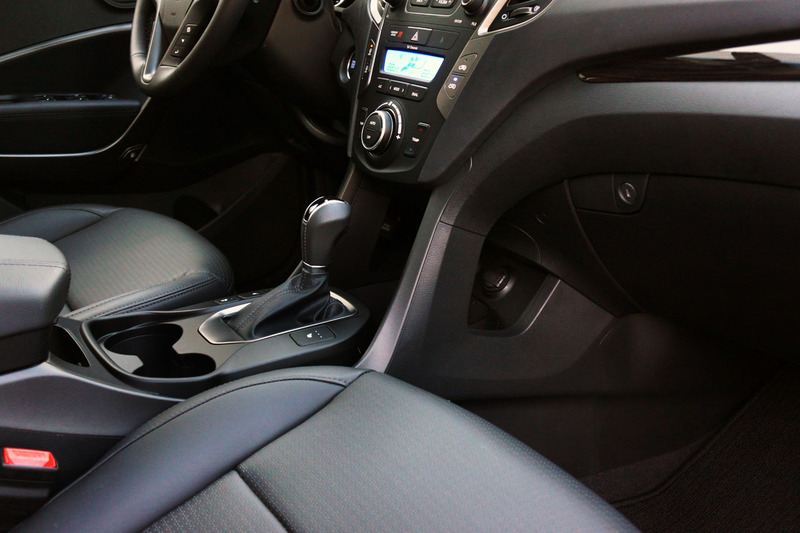 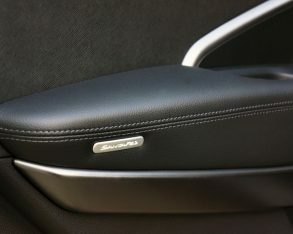 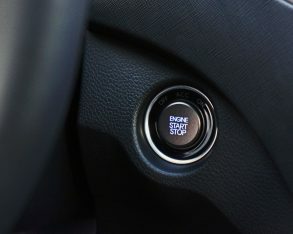 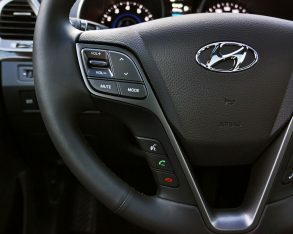 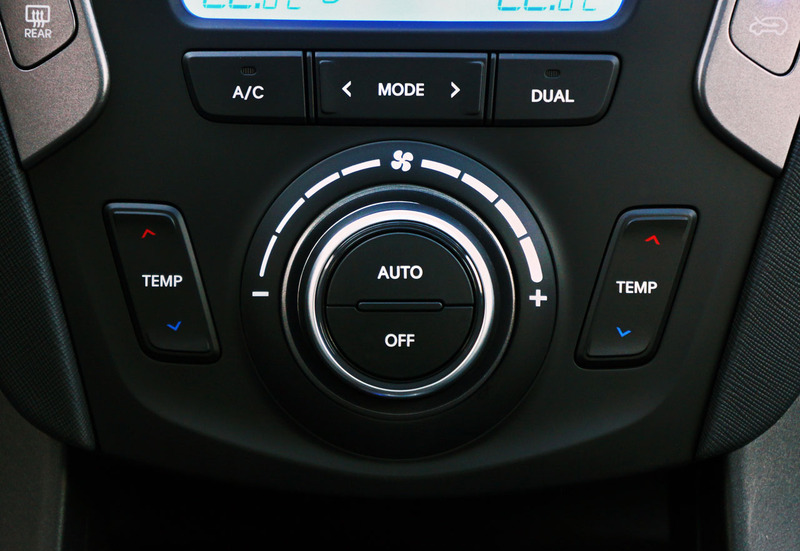 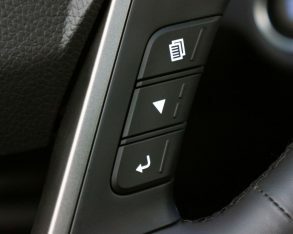 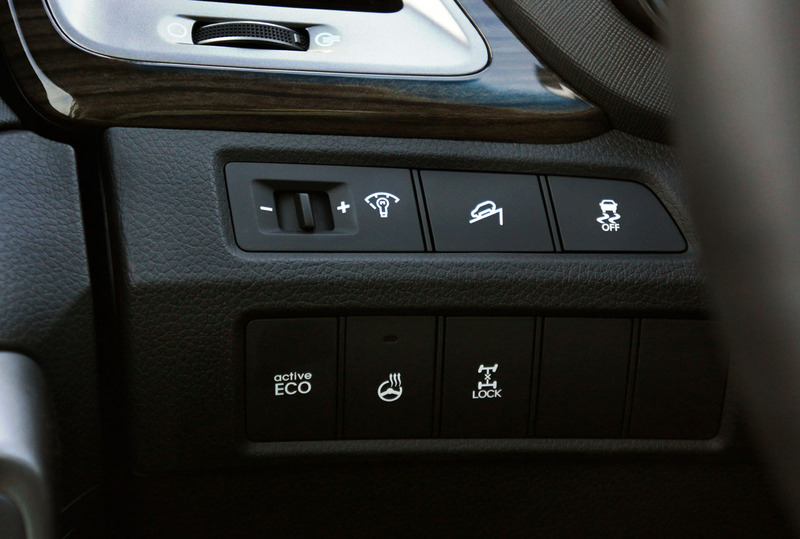 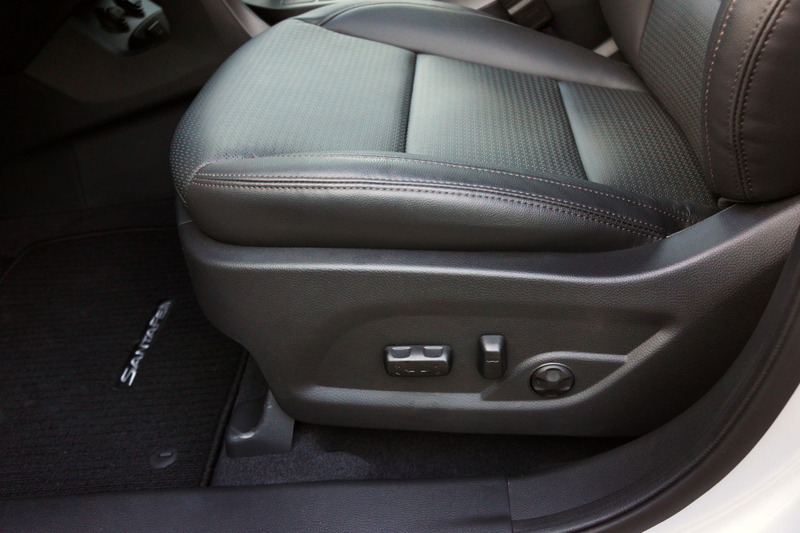 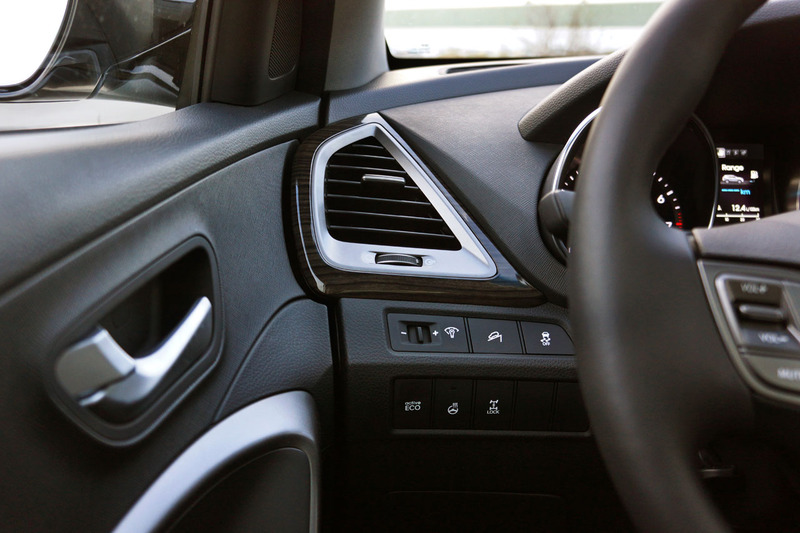 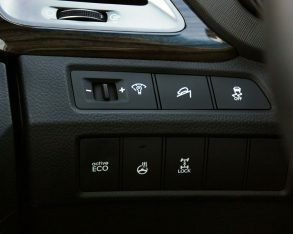 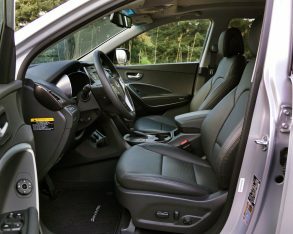 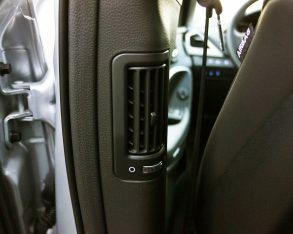 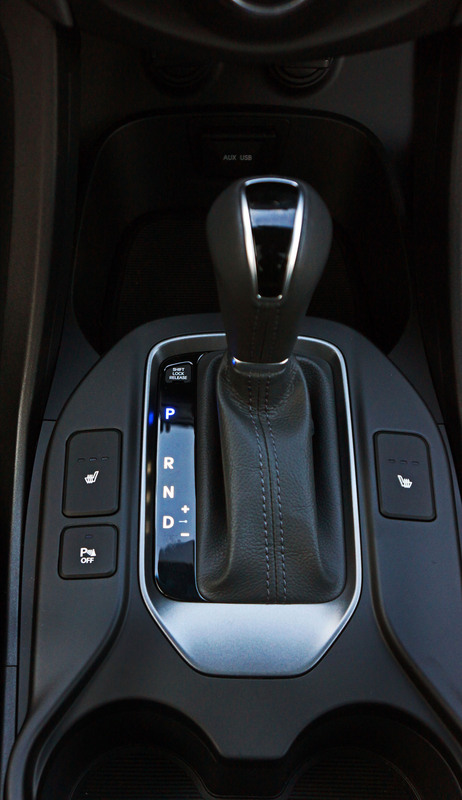 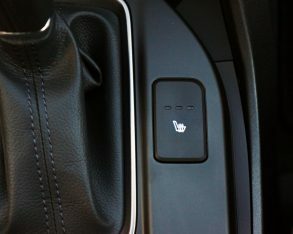 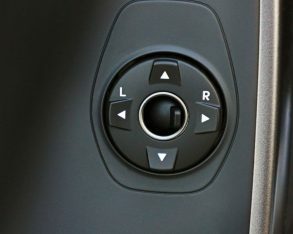 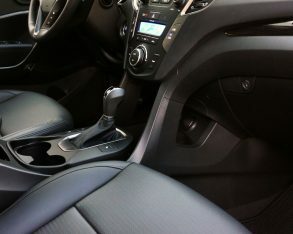 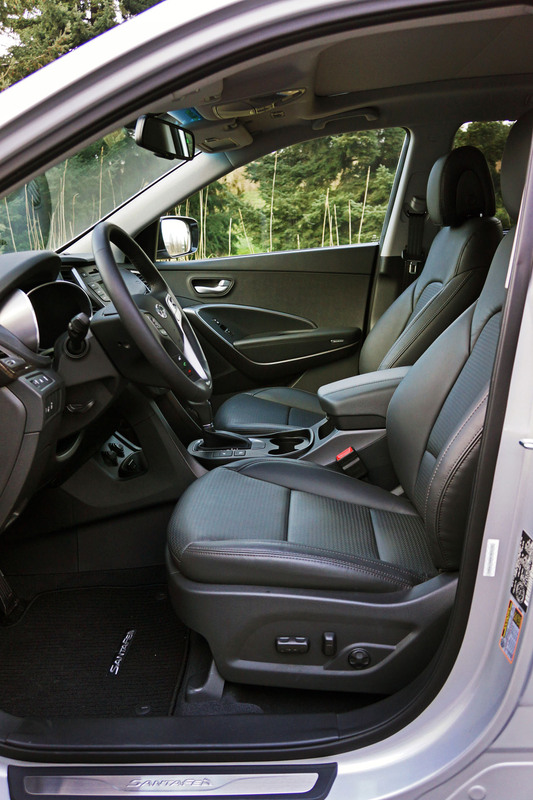 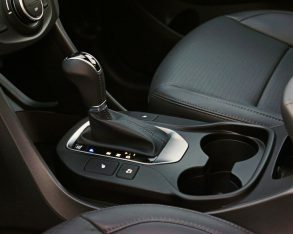 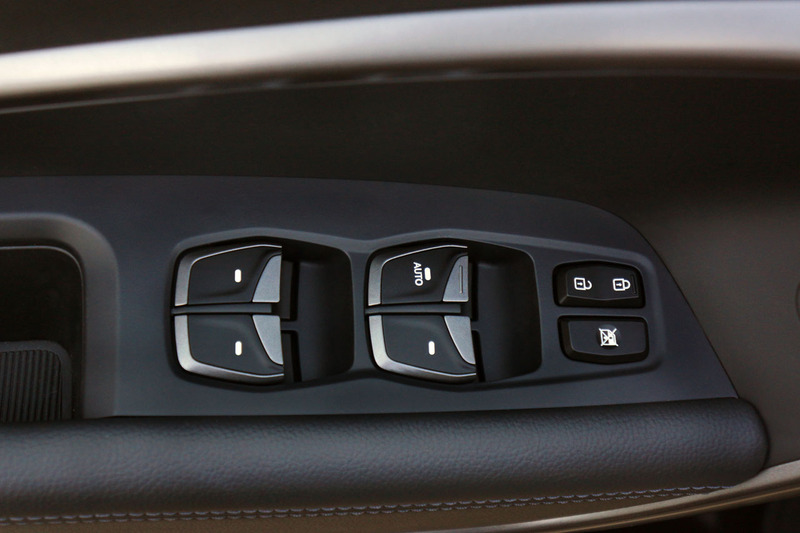 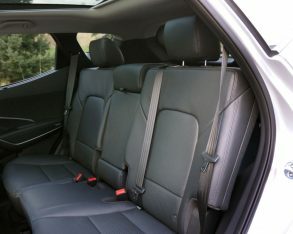 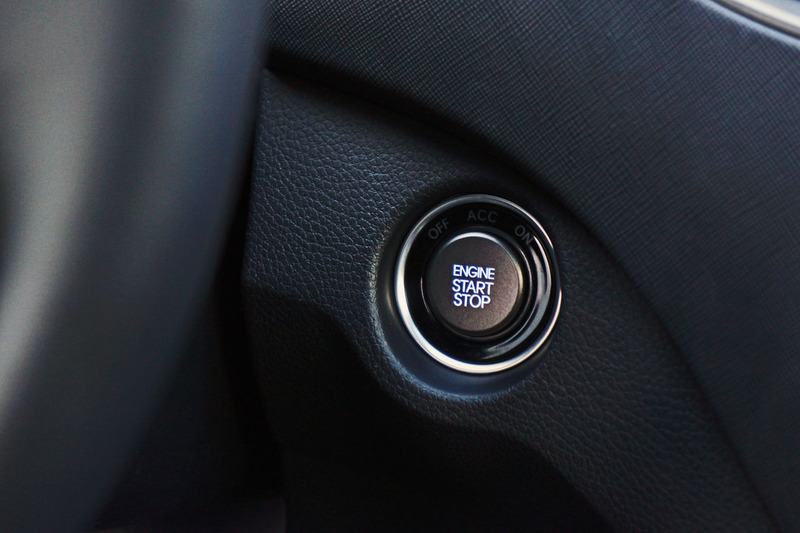 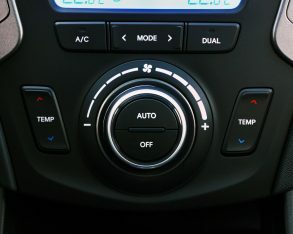 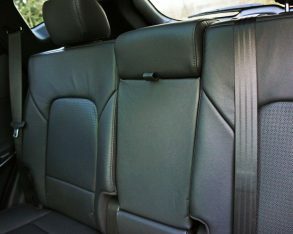 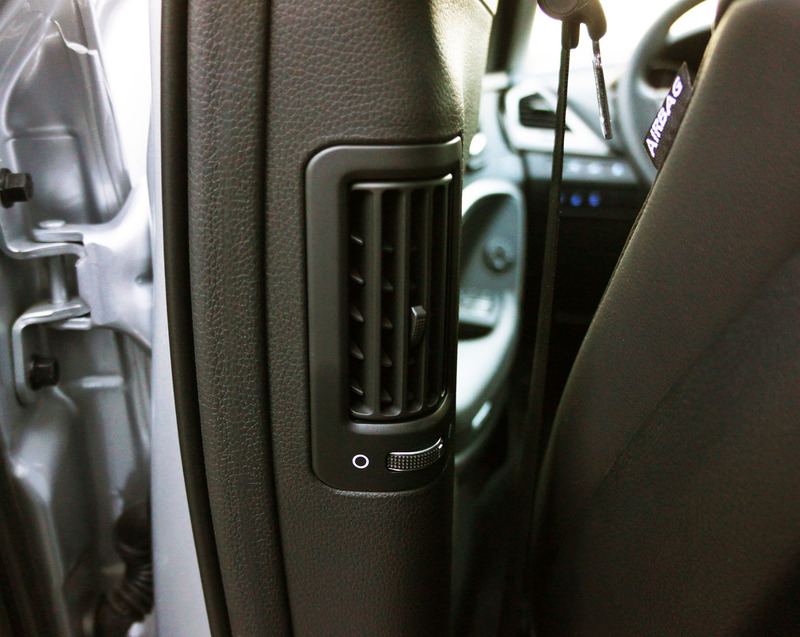 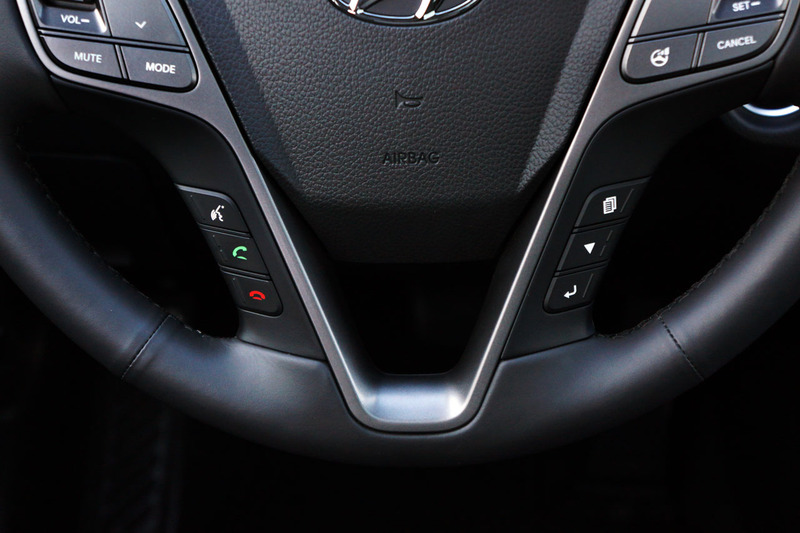 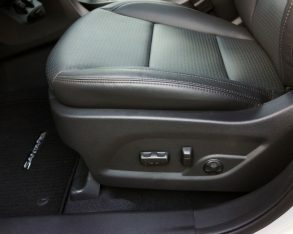 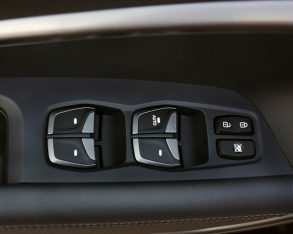 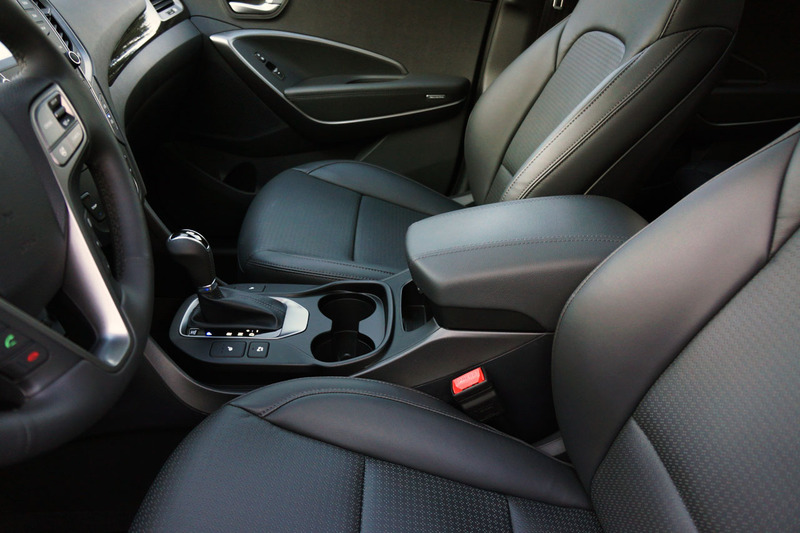 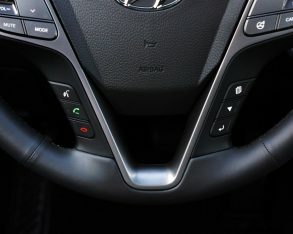 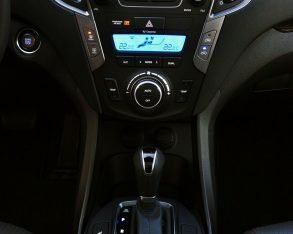 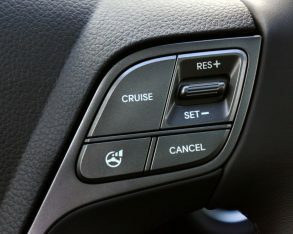 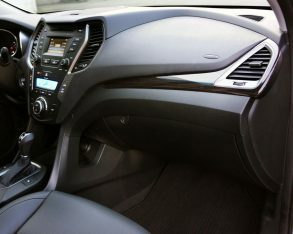 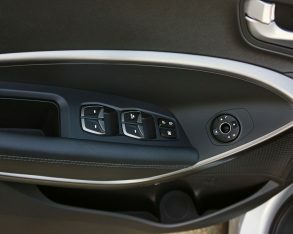 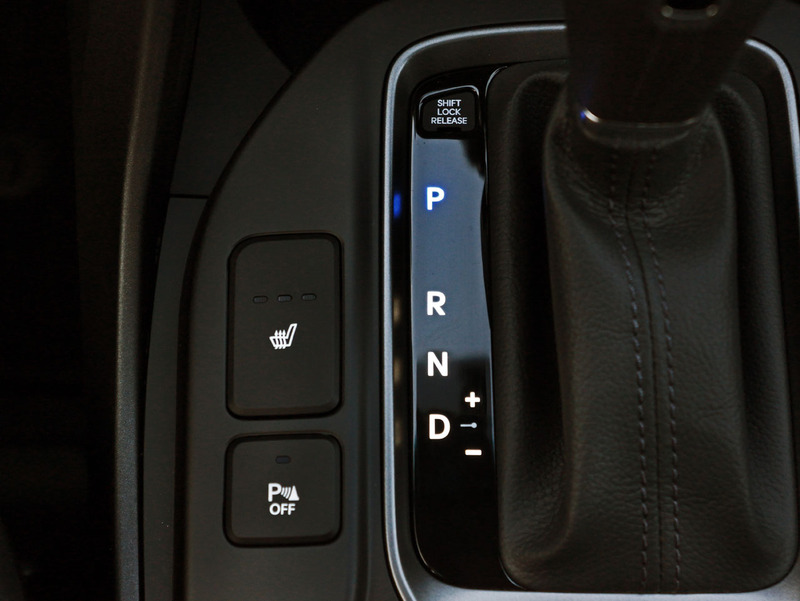 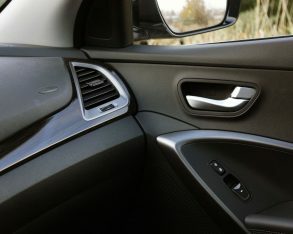 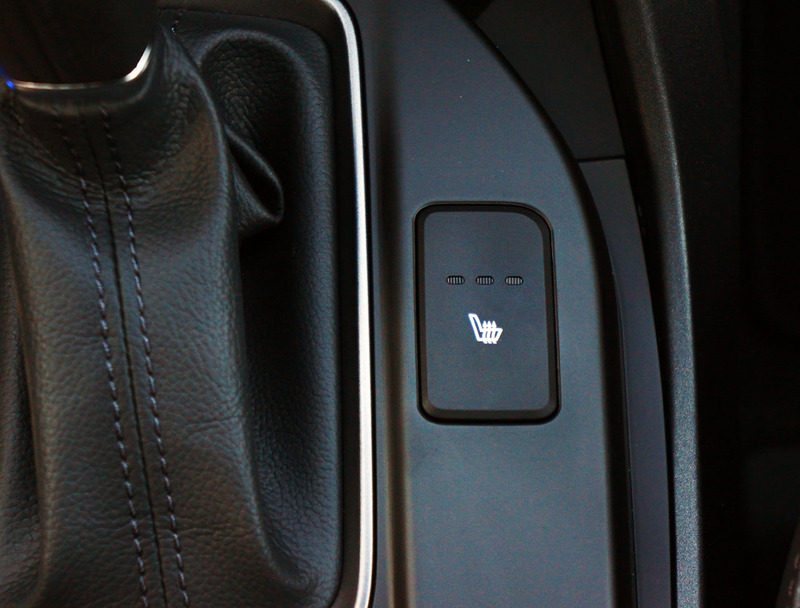 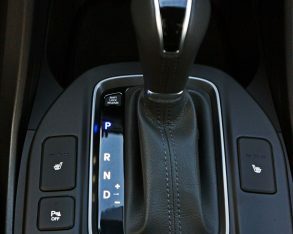 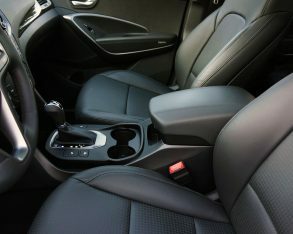 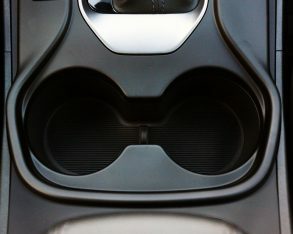 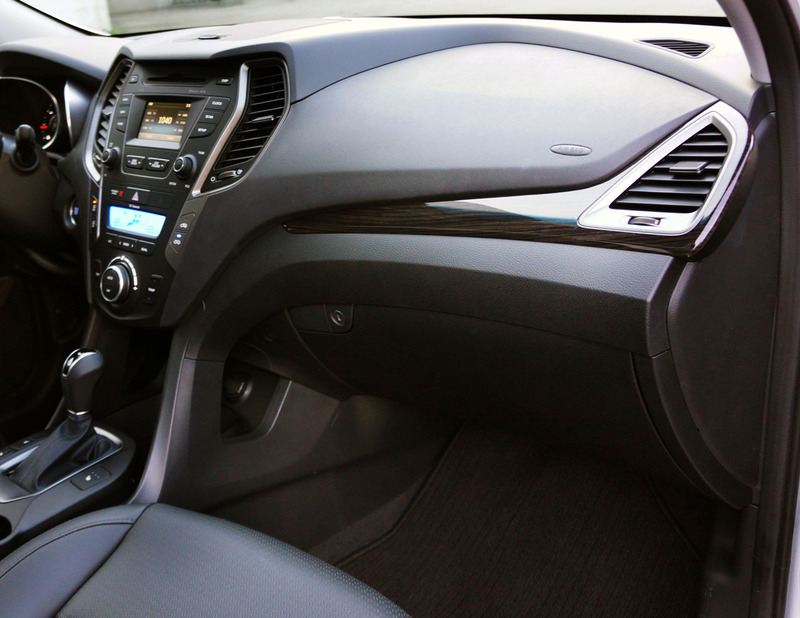 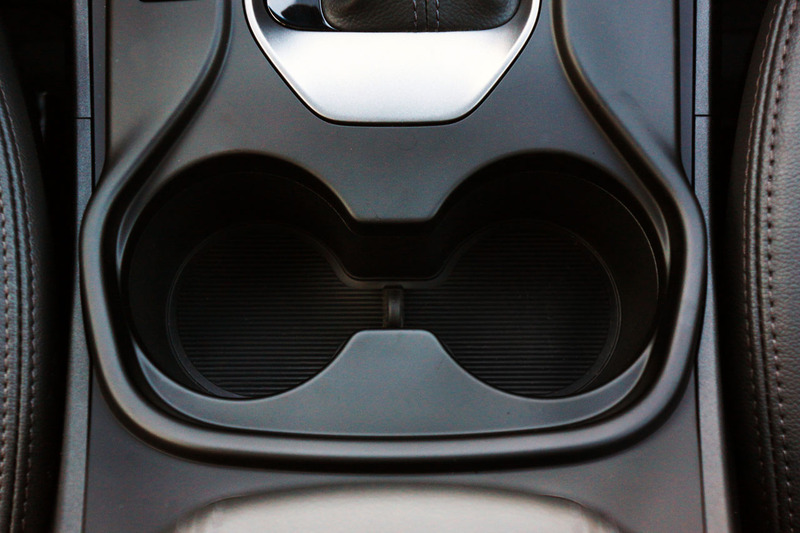 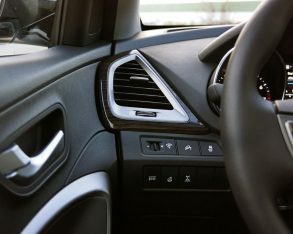 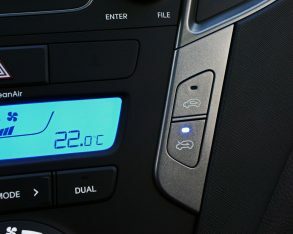 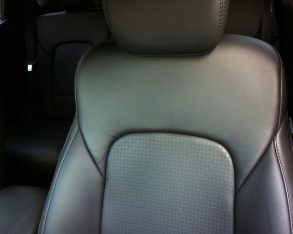 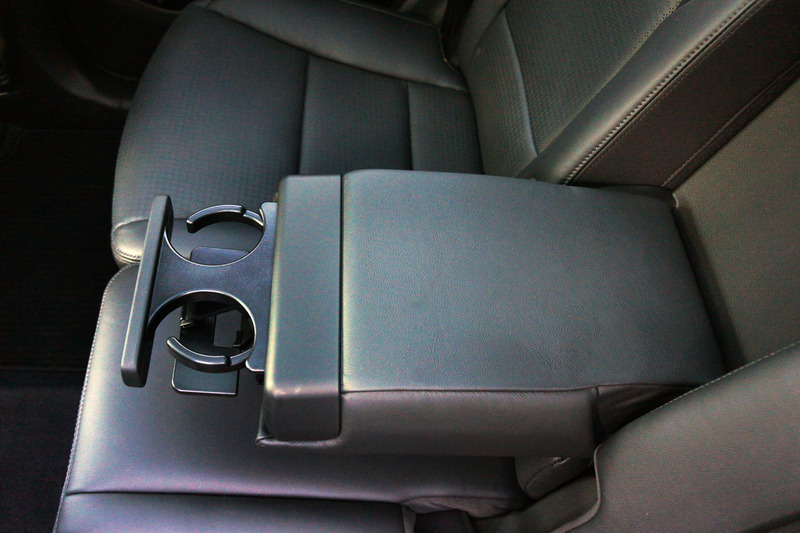 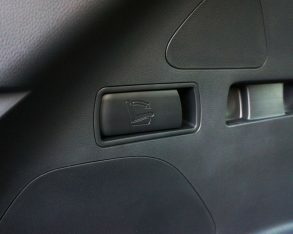 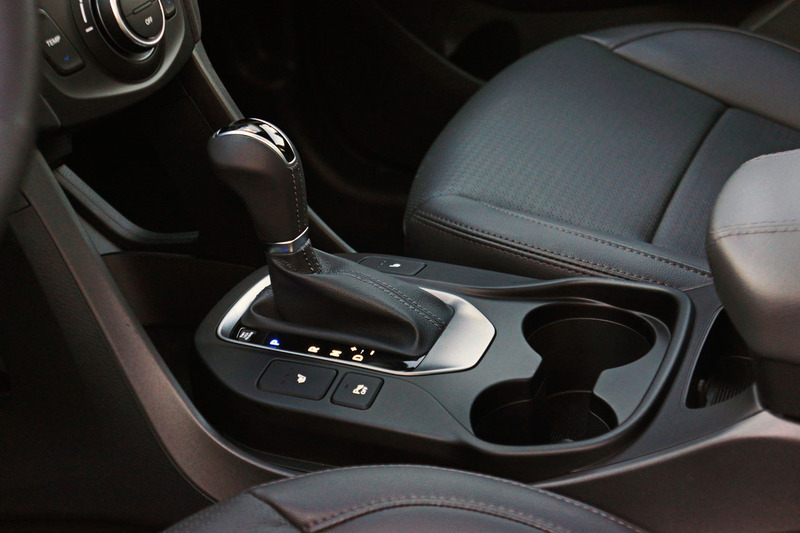 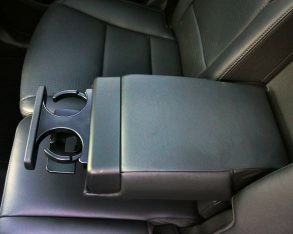 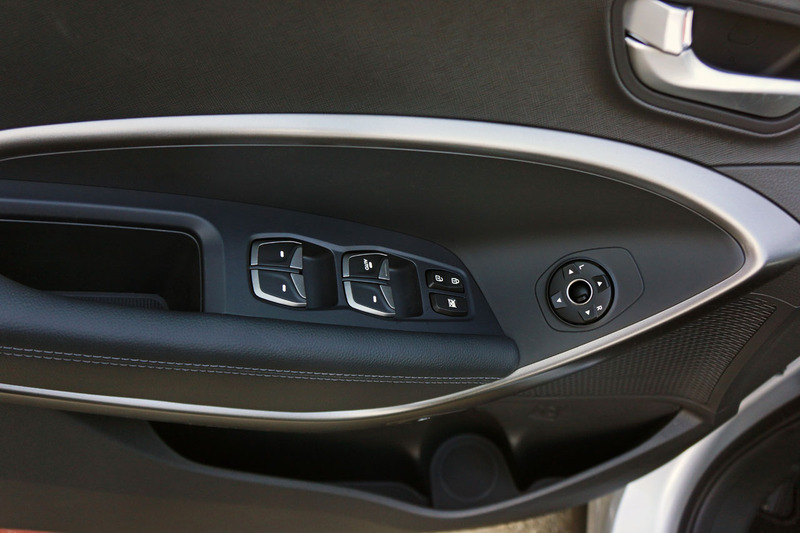 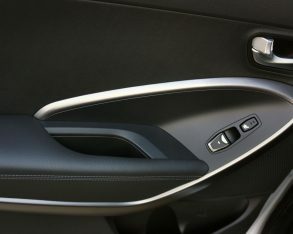 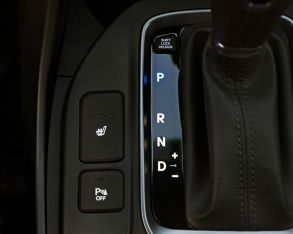 Standard three-way seat heaters sit next to the automatic gearshift lever atop the lower console, while a heated steering wheel button resides just to the left of the steering column beside additional switchgear for activating the fuel-saving Active Eco system, 4WD Lock, 115-volt AC adapter, and turning off the parking sonar. 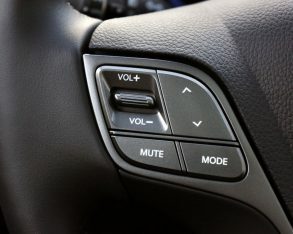 making this optional system standard in order to keep up with rivals. 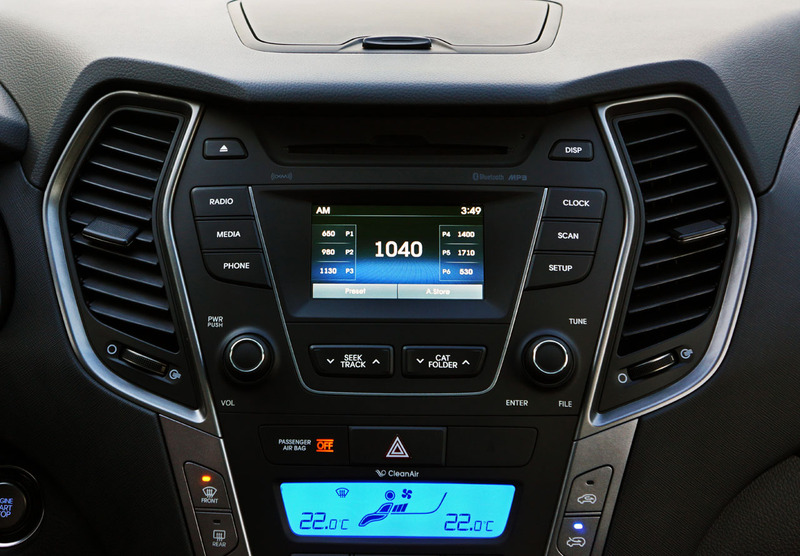 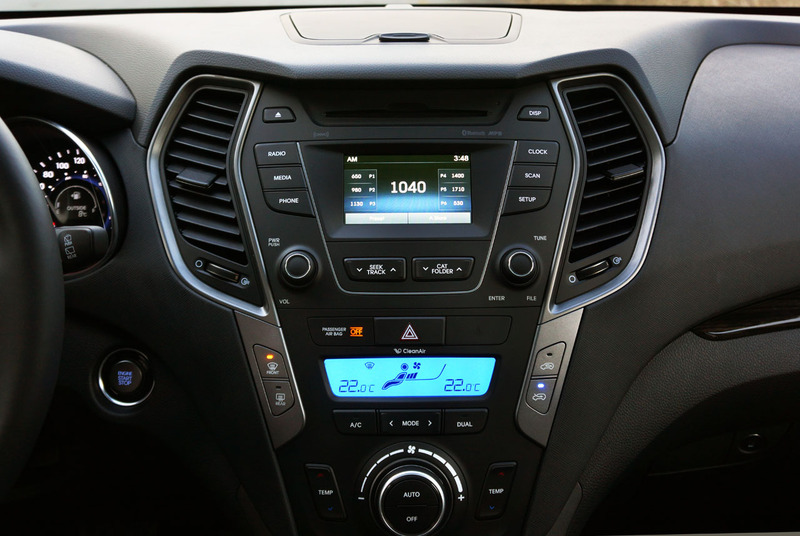 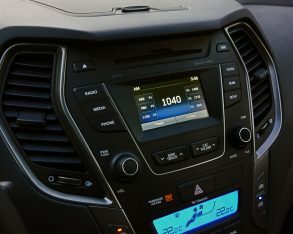 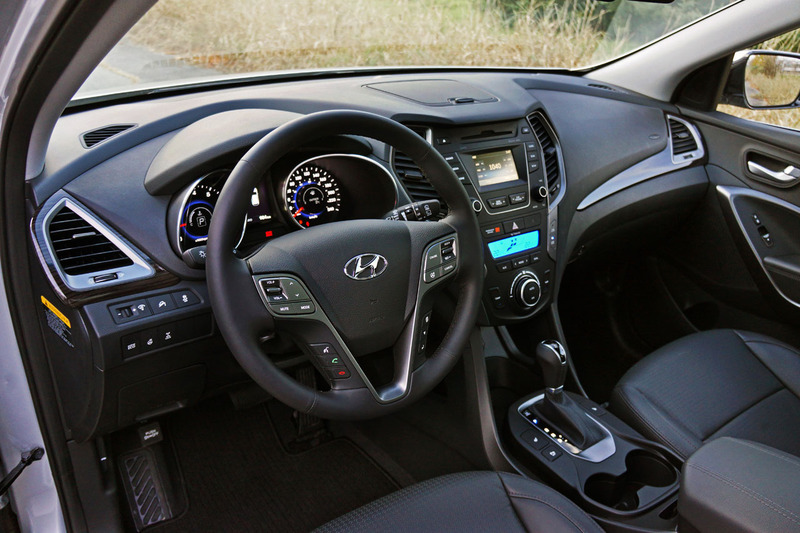 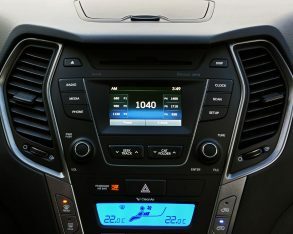 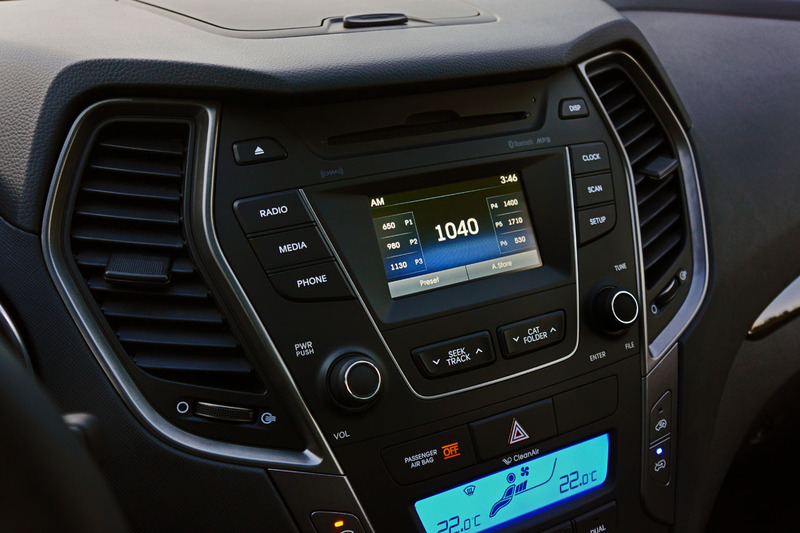 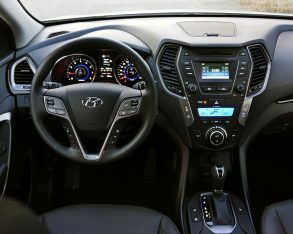 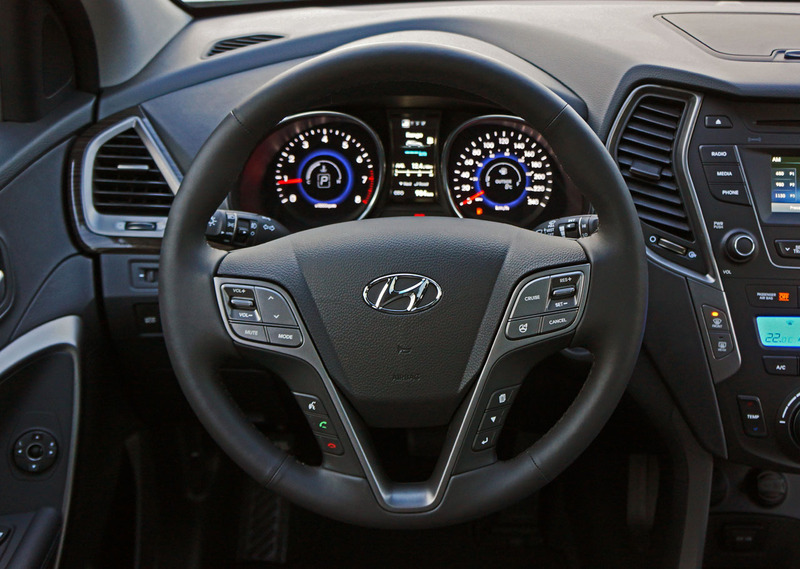 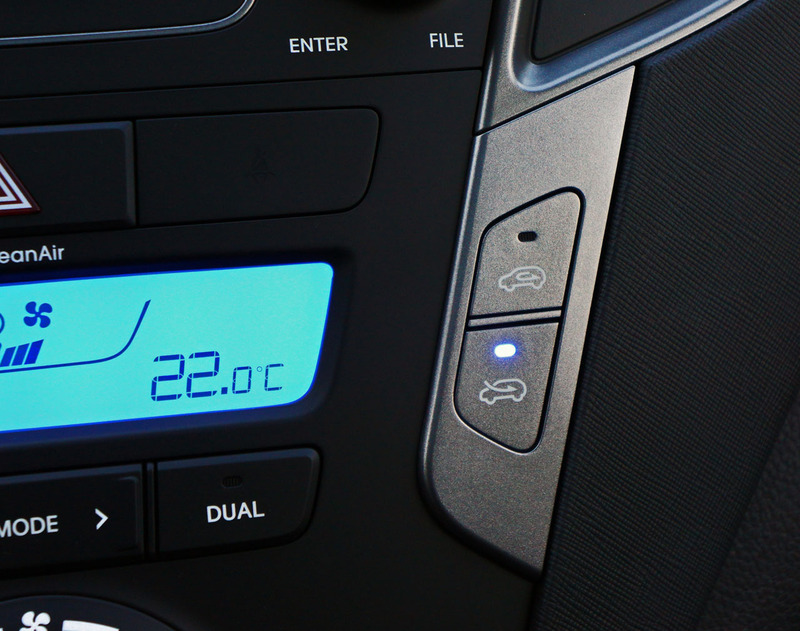 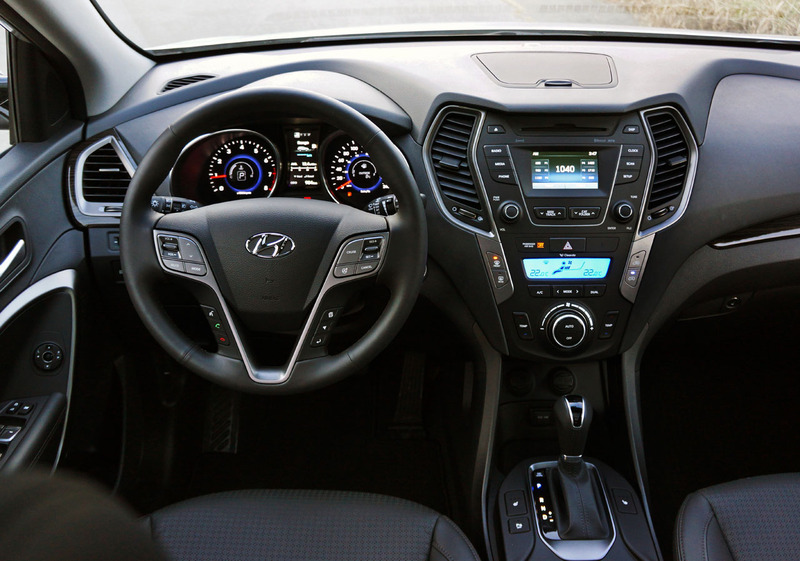 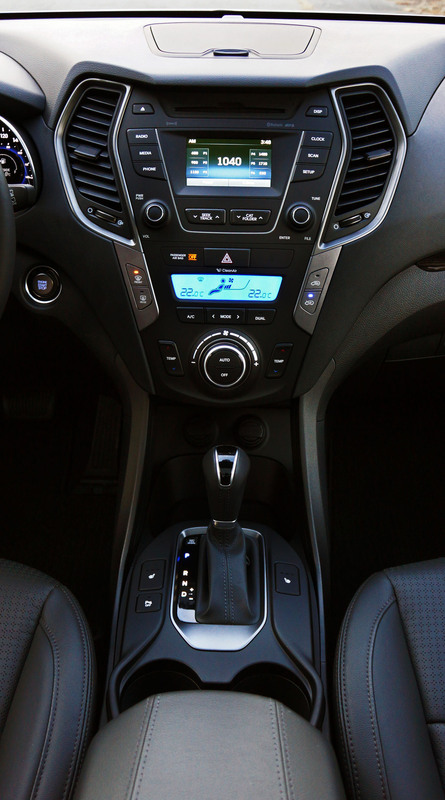 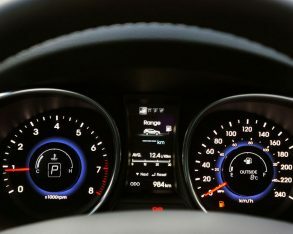 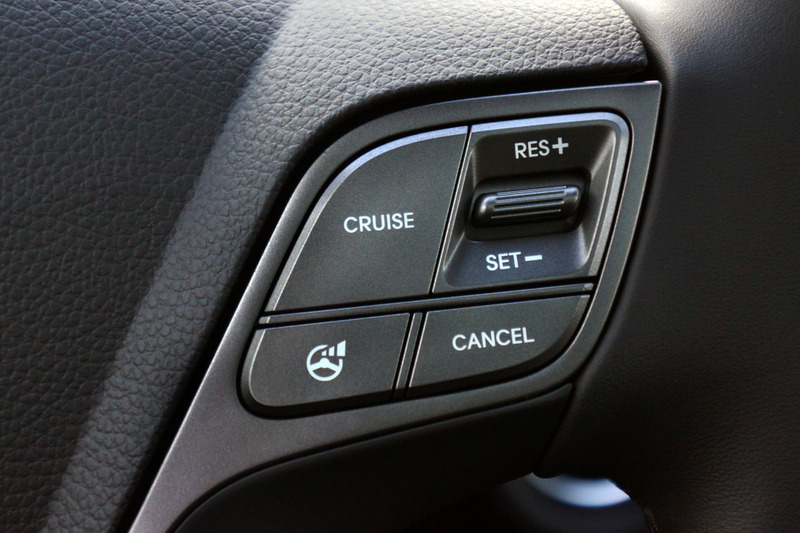 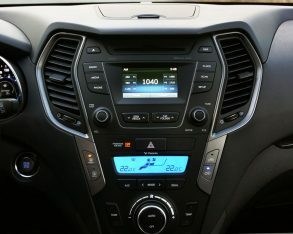 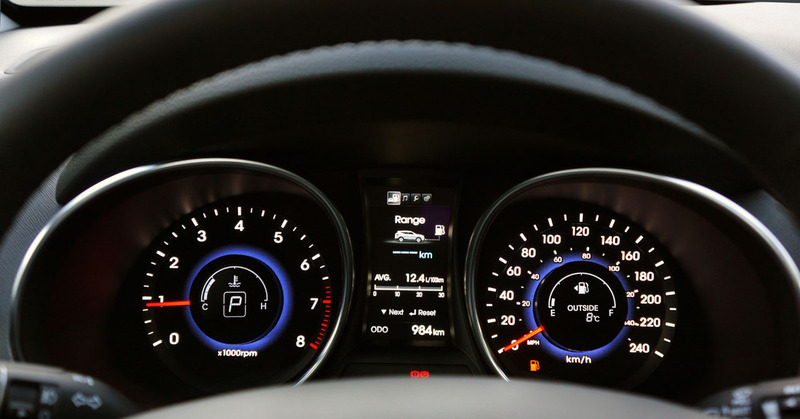 This said the Santa Fe’s display climate control interface is one of, if not the best in the mainstream sector. 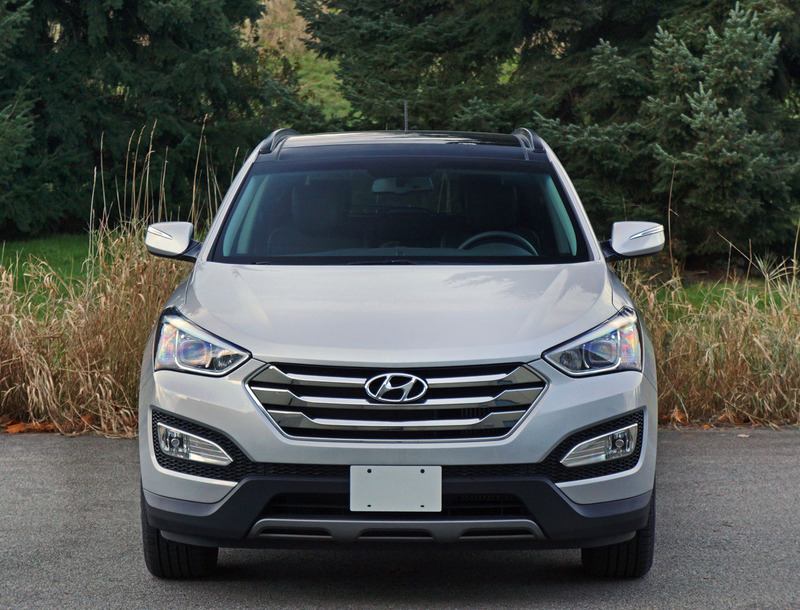 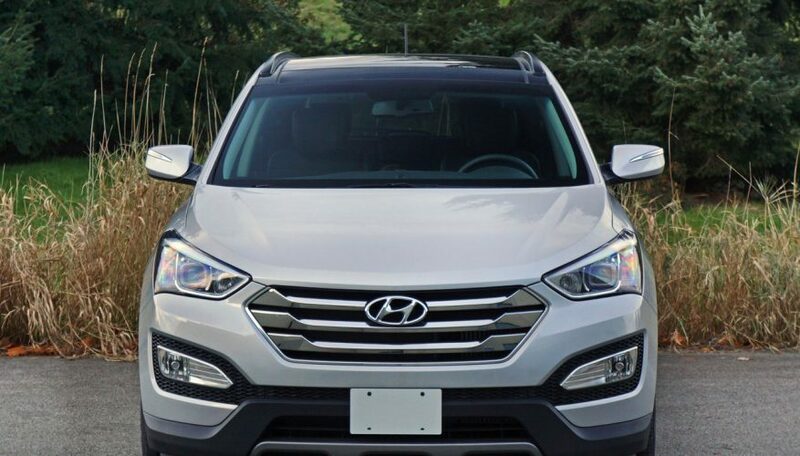 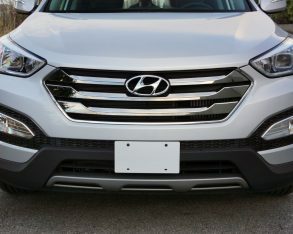 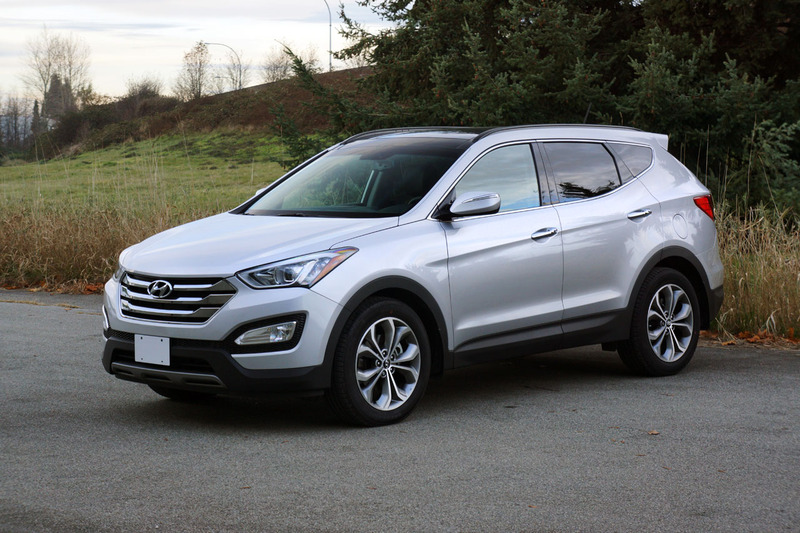 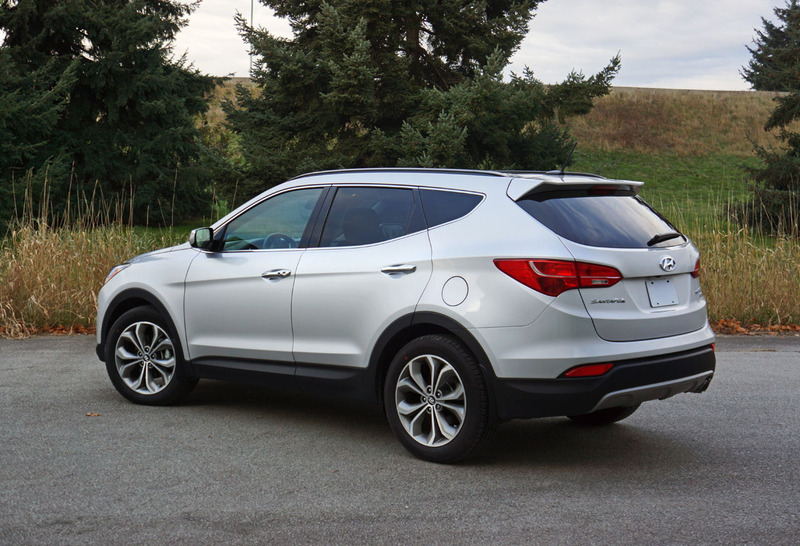 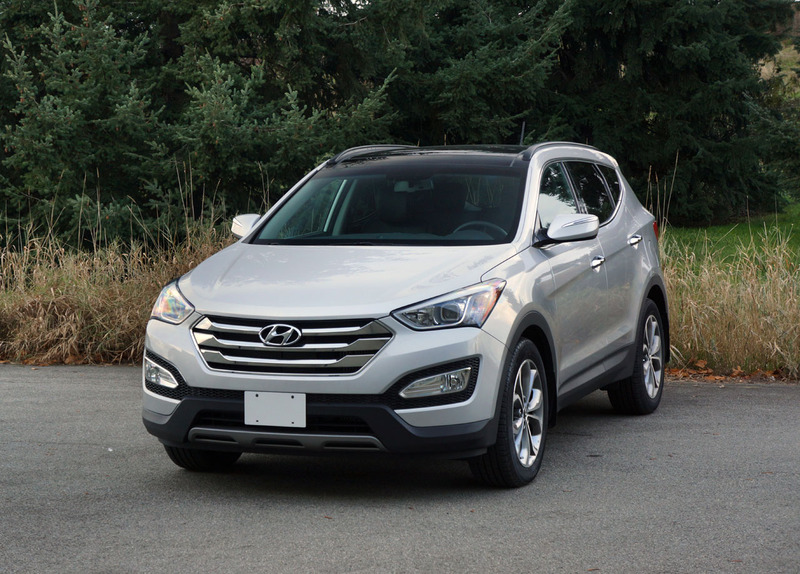 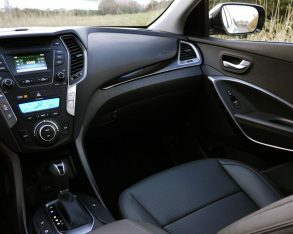 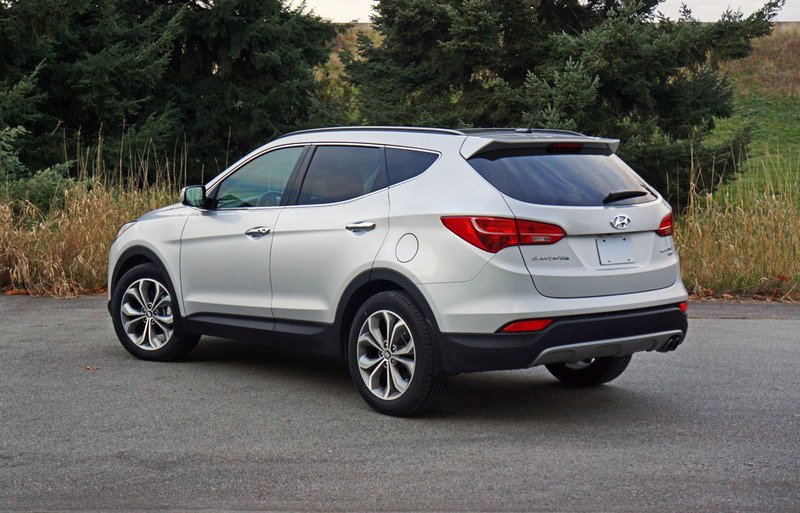 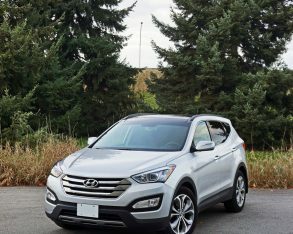 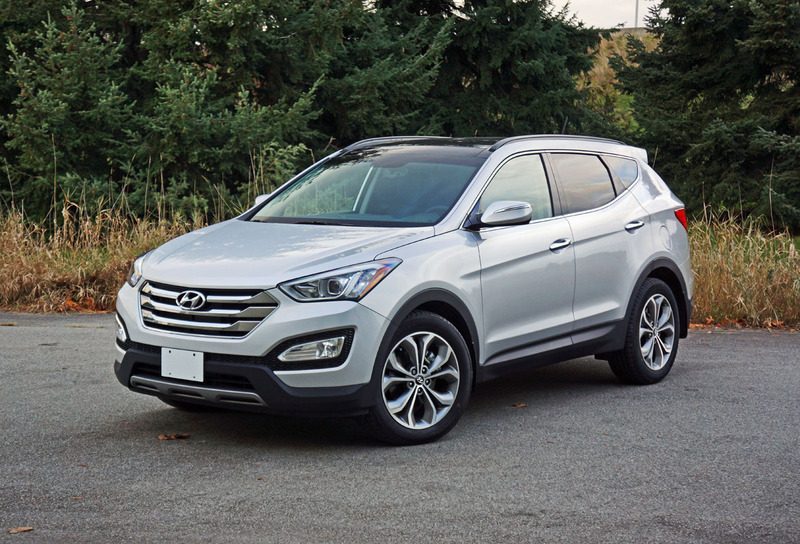 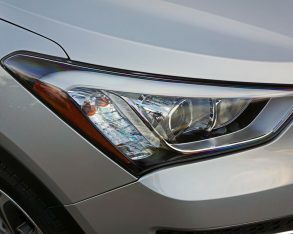 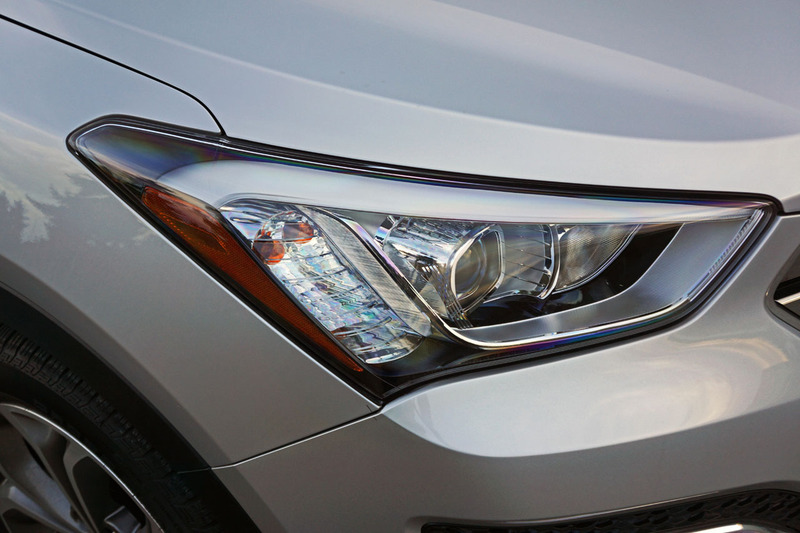 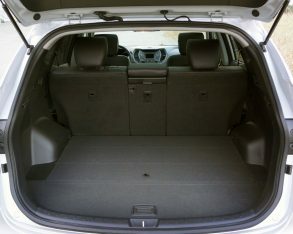 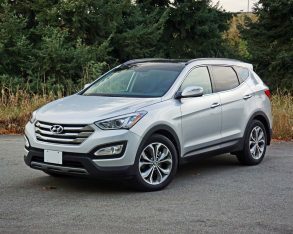 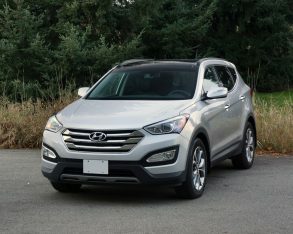 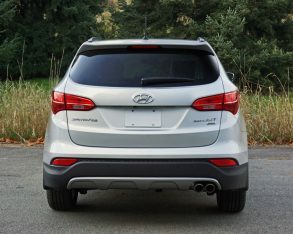 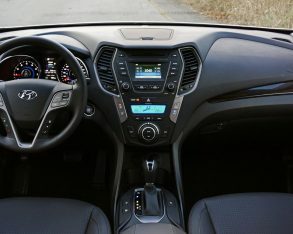 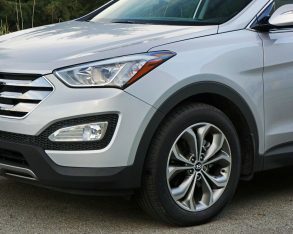 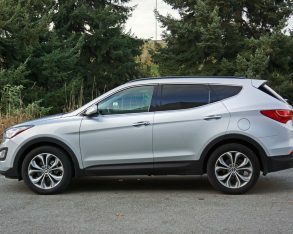 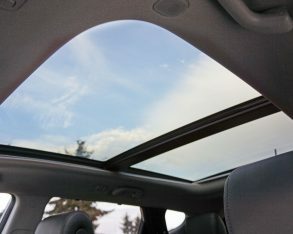 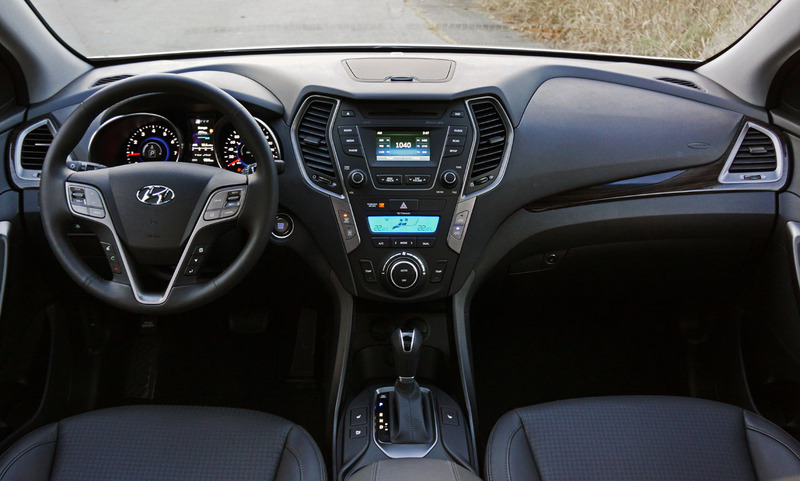 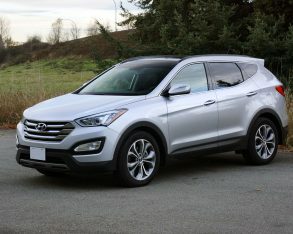 Put the Santa Fe Sport or its larger Santa Fe XL sibling beside any competitor and you’ll likely agree that the entire vehicle is one of the best midsize crossover SUVs in its class, and easily worthy of a closer look if you happen to be in the market for a vehicle in this category. 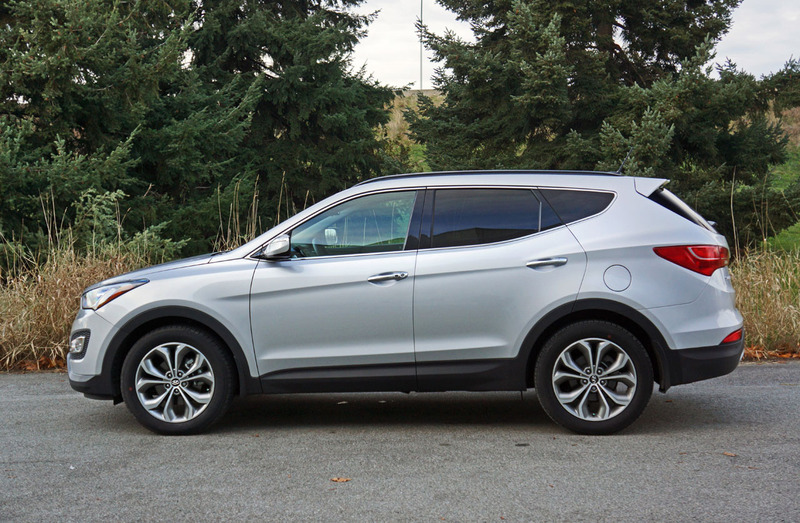 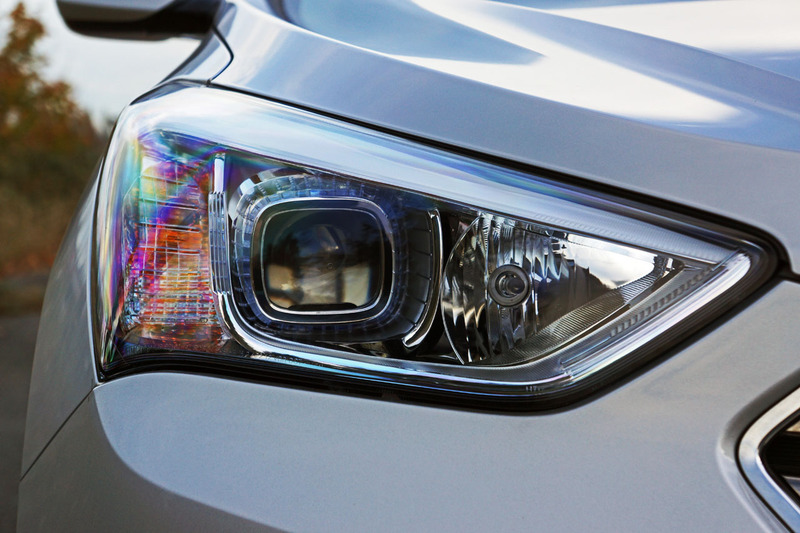 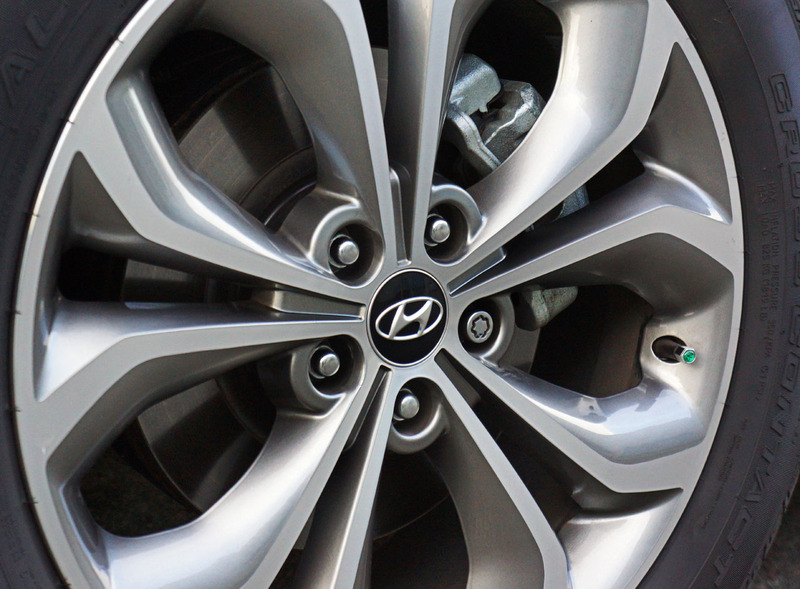 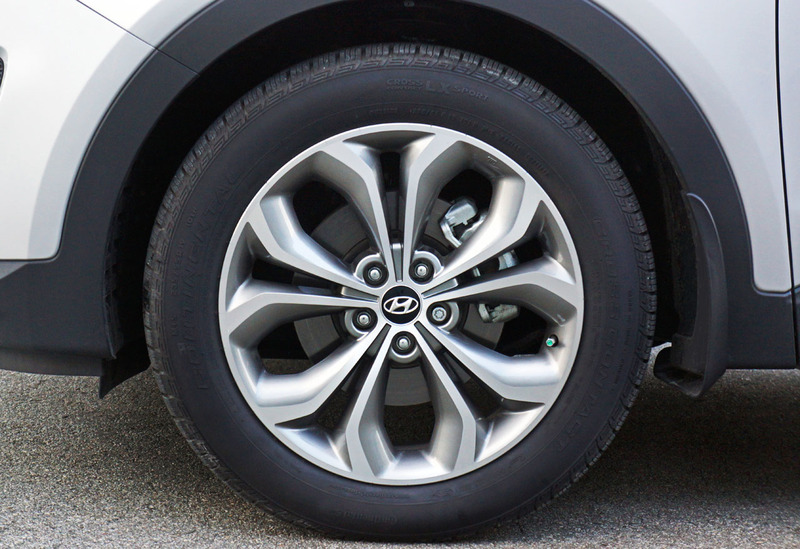 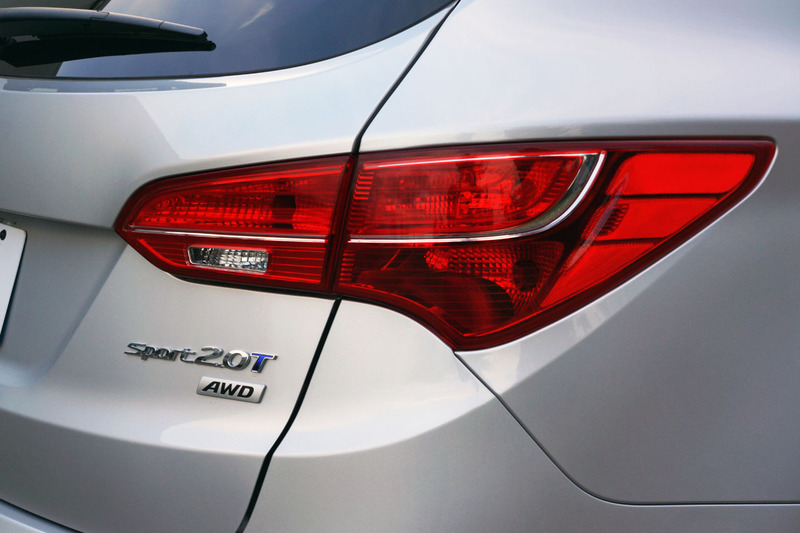 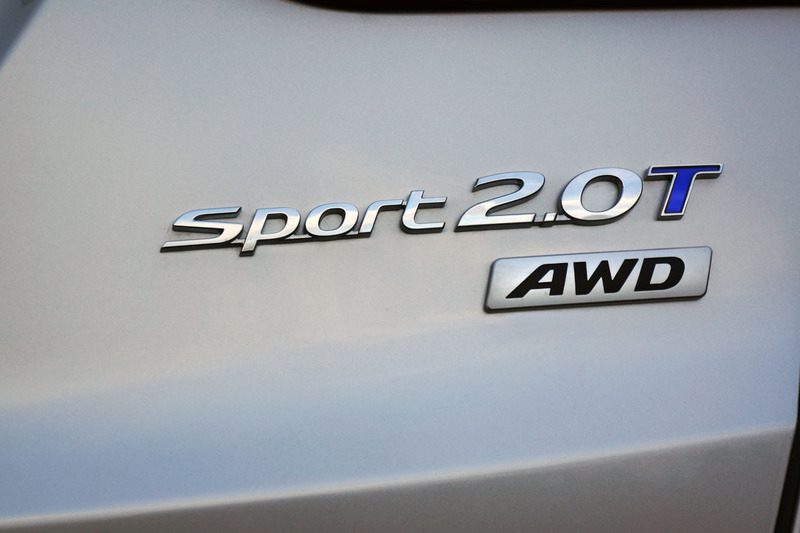 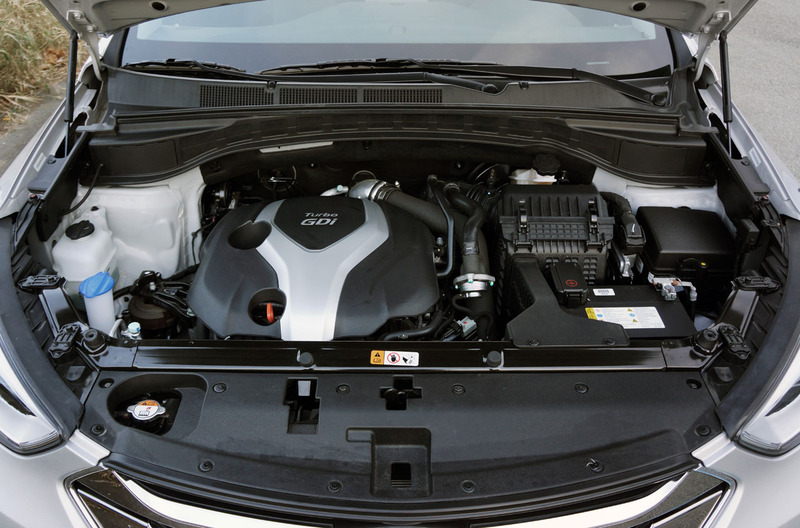 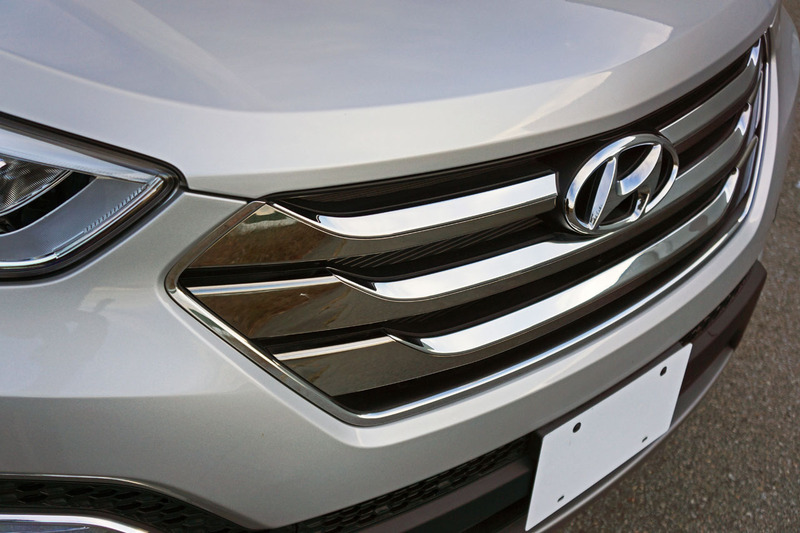 Stylish, feature-filled, high in quality, a strong performer and fuel-efficient, the Santa Fe Sport 2.0T impresses.